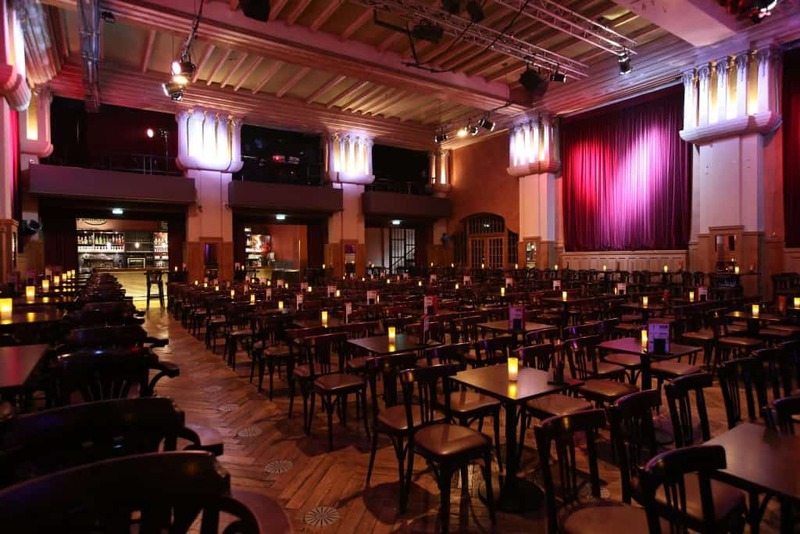 If you’re looking for a unique experience in Berlin, book yourself into a show at the Chamäleon theatre. 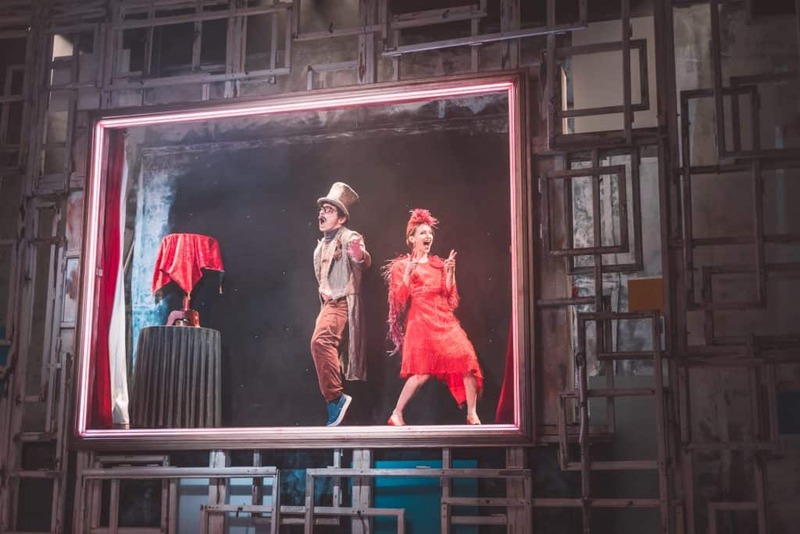 And if you’re lucky enough to be visiting in the next few months, you’ll be able to catch their latest spectacle, the delightfully entertaining Memories of Fools. 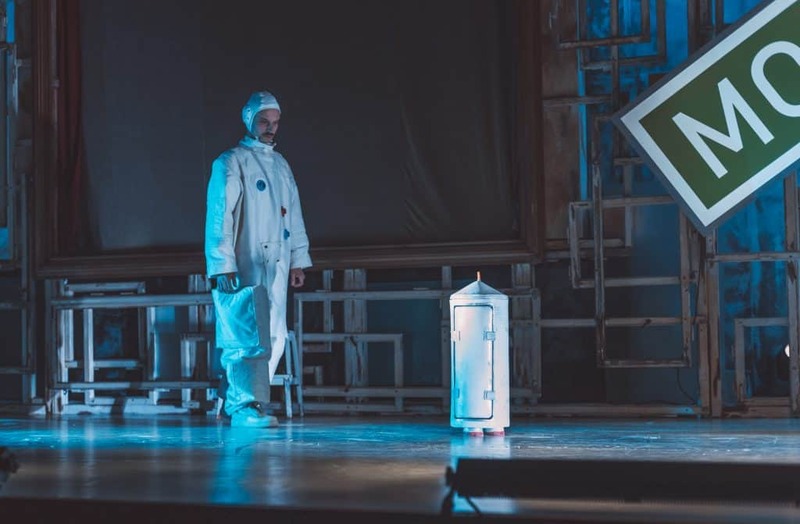 Memories of Fools is the latest production from legendary Czech circus company Cirk La Putyka. The show takes you on a whimsical journey through your childhood dreams and keeps you guessing as the plot twists from reality to fantasy. The fun and energetic performance is underwritten with a strong storytelling element that gathers momentum throughout the show. 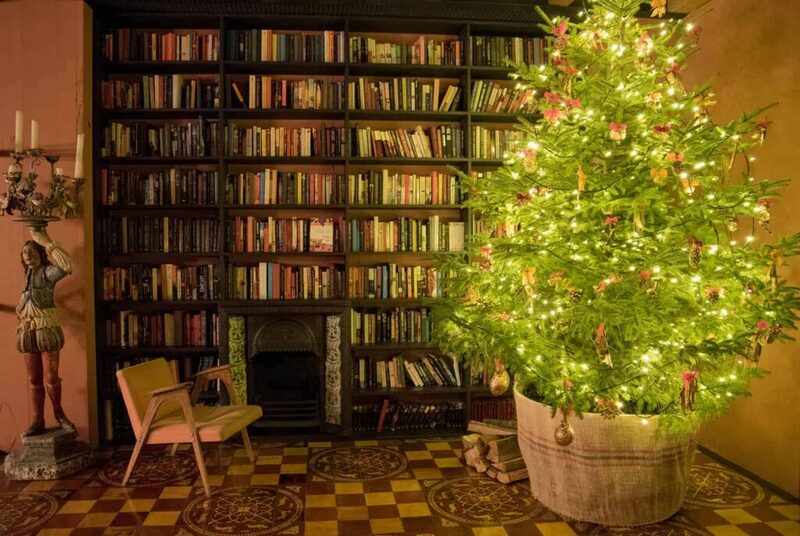 Read on to find out more about this charming tale told in the most sumptuous of surroundings. Walking into the Chamäleon Theatre is like stepping into another era. The lavish Art Nouveau style ballroom delivers a luxurious experience to the eye, without being ostentatious. Traditional parquet flooring is met by dark wood panelling on the walls, and the addition of thick crimson curtains adds to the appeal. The ballroom is laden with bistro-style chairs and tables, delivering a more intimate experience than the usual straight row-style seating arrangement. At the front of the theatre, the modest stage sits tantalisingly close to the seating area. A thick velvet curtain hangs from the ceiling to conceal the set design until it’s revealed at show time. It’s certainly the ideal environment to immerse yourself in theatre. 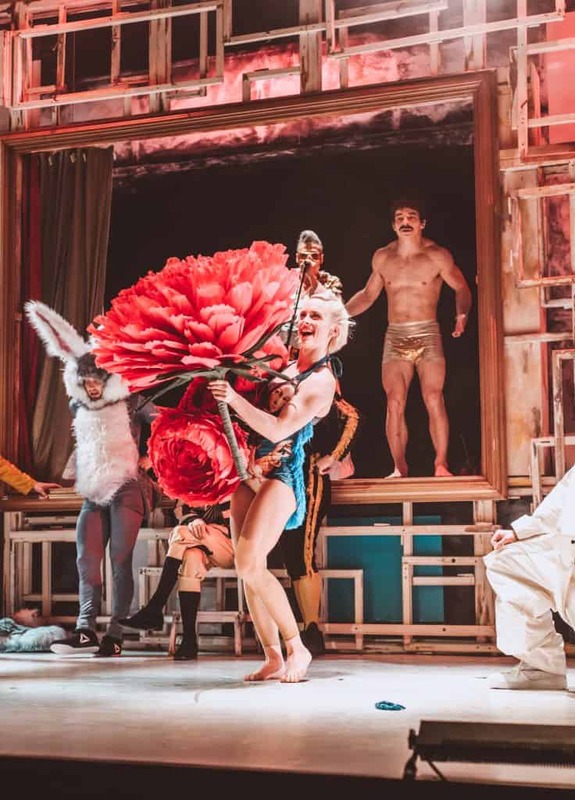 And indeed, Memories of Fools is an enveloping experience as the cast takes full advantage of the stage and ballroom floor. 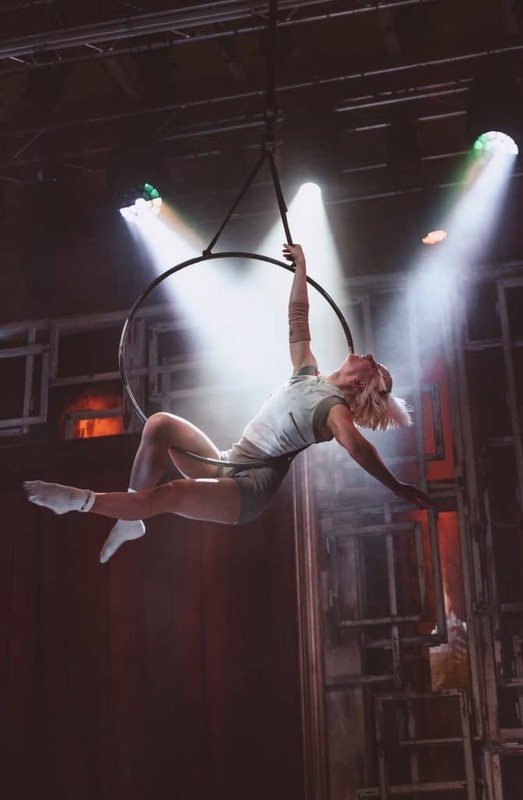 Berlin’s Chamäleon theatre is celebrating its 15th birthday this year, and in that time it has become the go-to place for Cirque Nouveau. 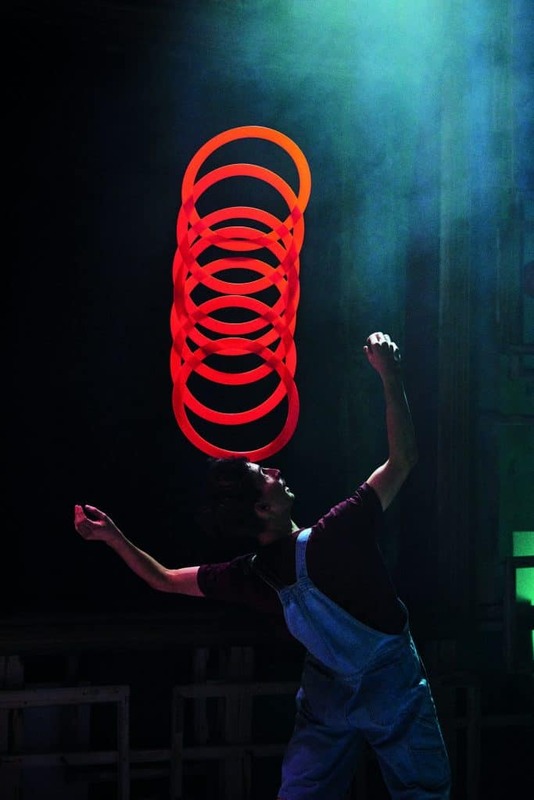 It is the only theatre in Germany to exclusively showcase new circus and its dedication to the art is multifaceted. Not only do they host extraordinary acts on the stage, but they’re also heavily involved in the production of new circus through their sister company, Chamäleon Productions. The Chamäleon theatre is located in the Hackesche Höfe courtyards in the centre of Berlin. They host two shows a year, with performances every day of the week except Mondays. Tickets can be purchased online in advance, or at the ticketing booth at the entrance to the Hackesche Höfe. I’m not a regular theatre attendee, so I was a little unsure of what to expect of the contemporary circus genre. Nevertheless, I normally enjoy the unique energy of live productions and I was excited for my debut experience at the Chamäleon theatre. 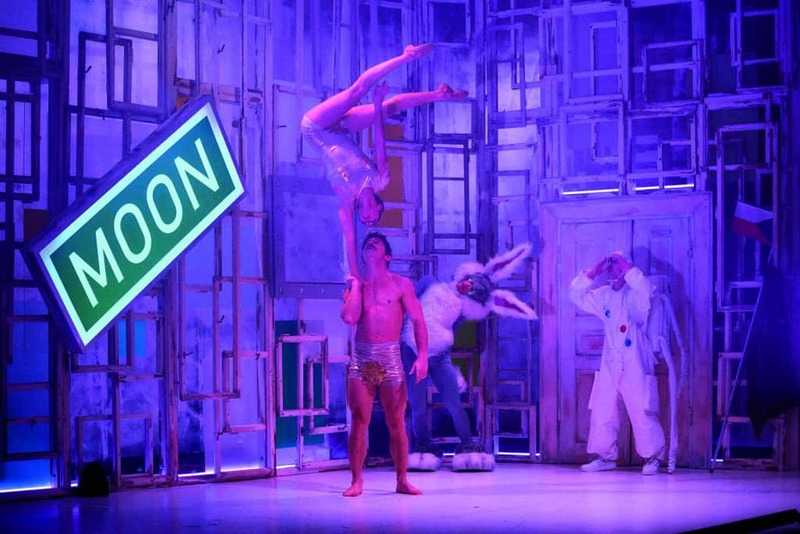 As the first performers appear before the curtain, the stage is unveiled to reveal a complex setup of overlapping wooden frames and there is a tangible excitement in the air. It’s a scenario a lot of people can relate to, either from their own childhood fantasies, or those of their children and/or grandchildren. 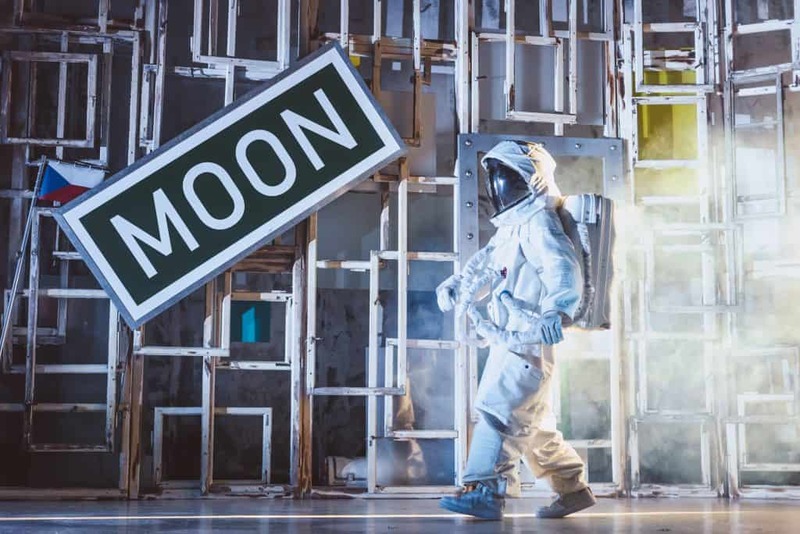 This, combined with the cleverly timed news clips of Neil Armstrong’s first steps on the moon (the show coincides with the 50th anniversary of the Apollo 11 moon landing) makes the storyline, which could otherwise venture into the abstract, even more engaging. As the show progresses, the storyline unfolds and we watch as the young boy realises his dream. It’s from the second half that the tempo changes and the audience’s mouths collectively gape at the antics being executed before us. 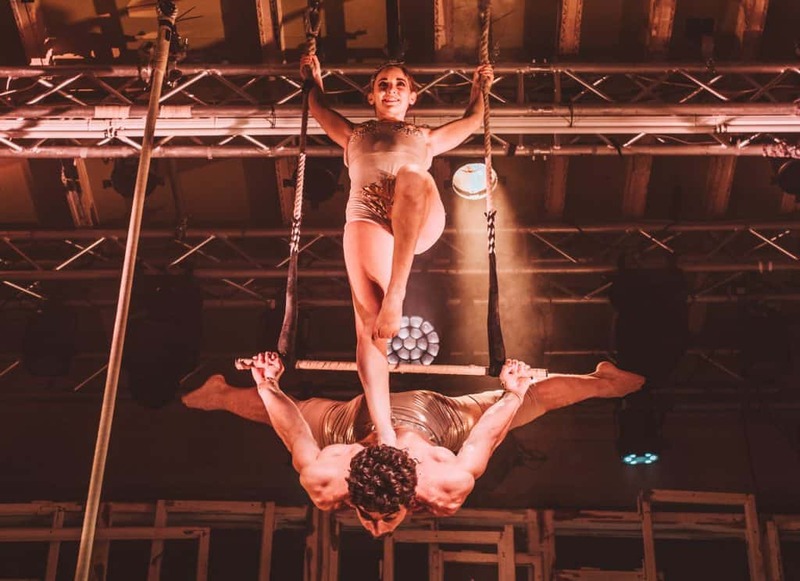 The performer’s talents get the chance to really shine here and we’re treated to a wide range of acrobatics alongside bouts of dancing, comedy and mime. Fanciful characters take to the stage in their numbers and you’re kept guessing as to who will pop up next! It’s easy to get caught up in the ambience and you’ll find your feet tapping along to the music before a tempo change has you gripping the seat or grinning at the sight of a flying bunny wagging his tail to the beat. Overall, Memories of Fools is a heartwarming and thoroughly captivating show. 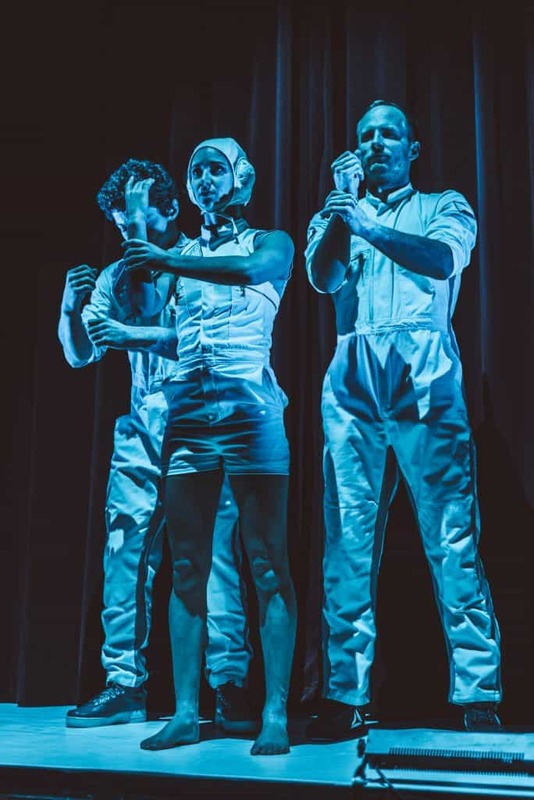 The immensely talented members of the Cirk La Putyka really rise to the occasion to deliver a multidisciplinary display that will appeal to the masses. 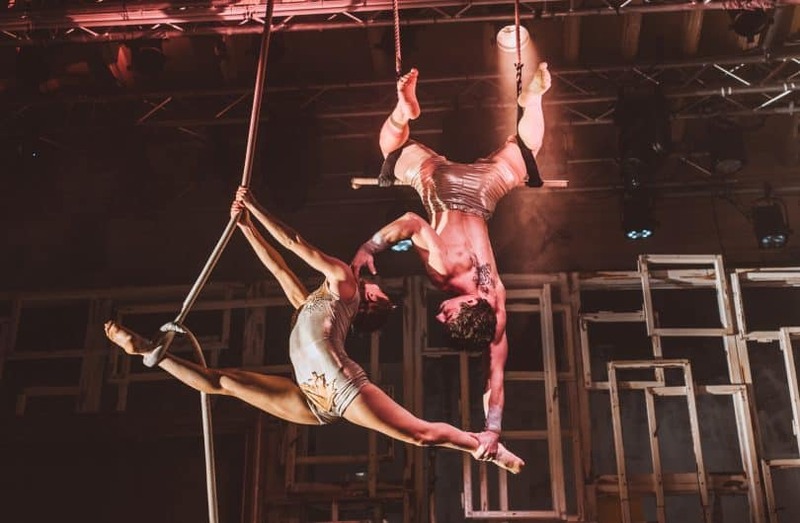 Czech circus Cirk La Putyka celebrates their 10 year anniversary in 2019 and the company is flourishing – winning awards and performing at venues worldwide. They excel at bringing each of the performer’s unique talents to the story in a way that feels intrinsically organic. 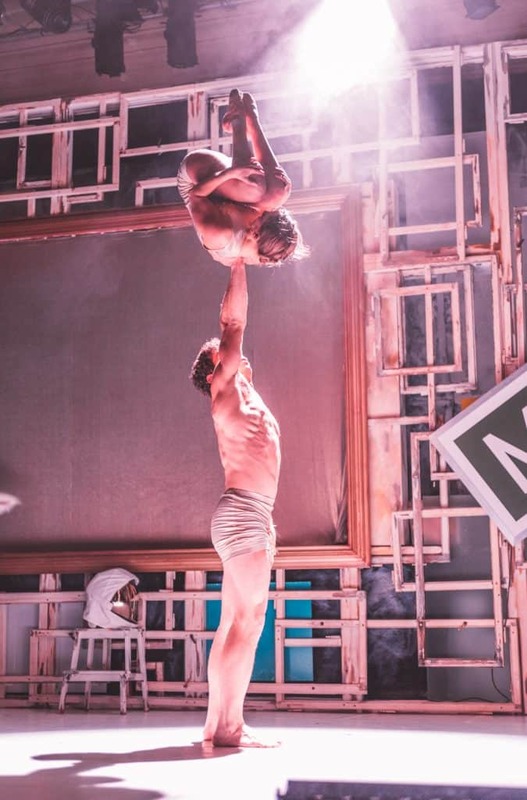 Acrobatics, theatre, contemporary dance, puppetry, concert and athletics combine to deliver a contemporary circus show that has been taken to new heights! While visiting Berlin, I stayed at the centrally located Holiday Inn Hotel. Right next door to the popular Alexanderplatz, it was the perfect base to explore Berlin and was a short 15-minute walk from the Chamäleon theatre. The room I stayed in was fairly compact. But it was modern, clean, and well equipped – so I’d highly recommend it as an affordable place to stay in Berlin. Getting around Berlin is inherently easy. The public transport system is uncomplicated, and if you pick up a Berlin Welcome Card from the airport you’ll be able to jump on & off as you please, without having to purchase tickets each time. I had an amazing time at my first foray into the world of new circus. Memories of Fools was equally enchanting as it was enthralling. And I can’t think of a better place to experience the thrills and comedic value of the show than the Chamäleon theatre. 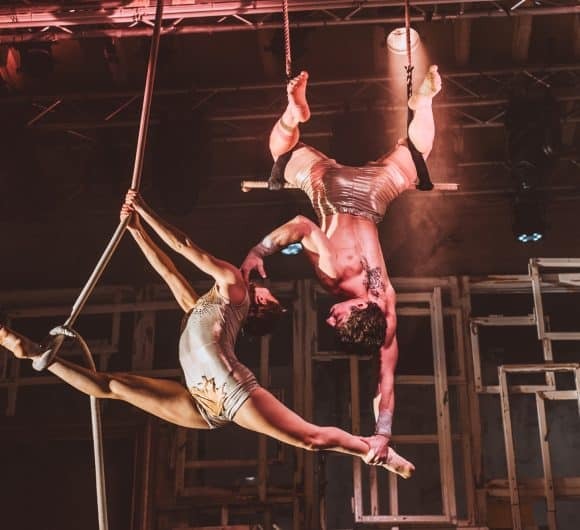 Next time you’re in the city, do yourself a favour and grab some tickets to their latest circus! *I was hosted in Berlin by the Chamäleon theatre for the purposes of providing this review. As always, I retain full editorial control and all opinions expressed are my own. To know France is to love France. 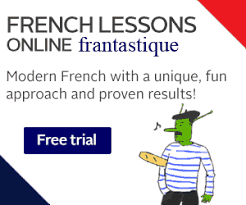 But how do you get to know a country as intricate as France? From the German-influence infiltrating the eastern border, to the Mediterranean flavour of the French Riviera, and the idyllic islands at a tickling distance of the country’s western shores, France is as complex as it is compelling. And while most people who visit France land in Paris, you’d be doing yourself a disservice if you ventured no further than the world’s favourite capital. Sure, spend a few days eyeing up the Iron Lady, sipping café noir in a quintessential curbside bistro, and learning the art of flaneur… But then drive, train or bus to another corner of l’hexagone to discover another world. One that is sure to seduce you with its intoxicating charm and universally appealing lifestyle. France is a fairly large country (by European standards) and for the uninitiated, it can be a little tricky trying to visualise where everything is. The below map plots out our suggestions of places to see in France, so that you can get your bearings easily. Simply click on the markers to reveal each location. Alsace is a quintessential frontier zone, part of that northern French hinterland that has changed hands between France and Germany so often over the centuries. As may be expected for a place-between-worlds, Alsace has forged its own unique culture and identity, neither totally French, nor completely German, but always, absolutely Alsatian. This is a region with its own dialect, a rich and distinctive gastronomic culture, and an extremely long history of winemaking: people have been producing wine here since the 2nd century. The Alsace wine route boasts more than 800 vineyards over a distance of 105 miles and offers a host of treats for lovers of viticulture. Indeed, the oldest barrel of wine anywhere in the world may be found in a dark cellar beneath the Hospice of Strasbourg. The vintage is 1472, and it has survived the ravages of two world wars and countless fires. Although they remain rooted in traditional winemaking, the producers of Alsace wines are also industry pioneers, and it was here that some of the first biodynamic vineyards were established. 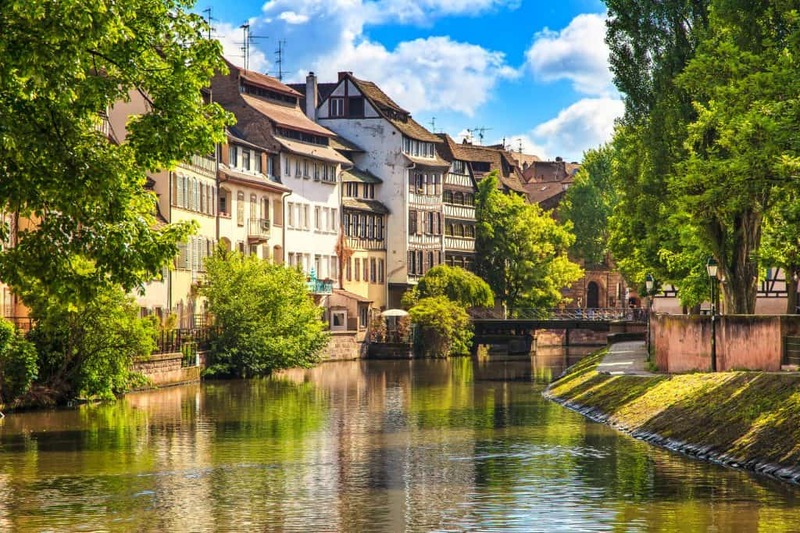 Throughout the summer, a swathe of festivals and food markets crop up along the wine route, making Alsace an extremely attractive prospect for a summer road trip. Yet, Alsace has so much more to offer beyond its vineyards and its hearty food culture. The Renaissance streets of Strasbourg and Colmar, with their painted timbered buildings and cobbled paving stones, offer charm in abundance, particularly at Christmas, when they are dressed in lights and filled with festive markets. Outside the cities and towns, the luscious, green landscape is the ideal place to retreat from the world. Stretching from the Rhine to the dramatic hills of the Vosges, the Alsace is a natural treasure, and there’s plenty to keep nature-lovers occupied. 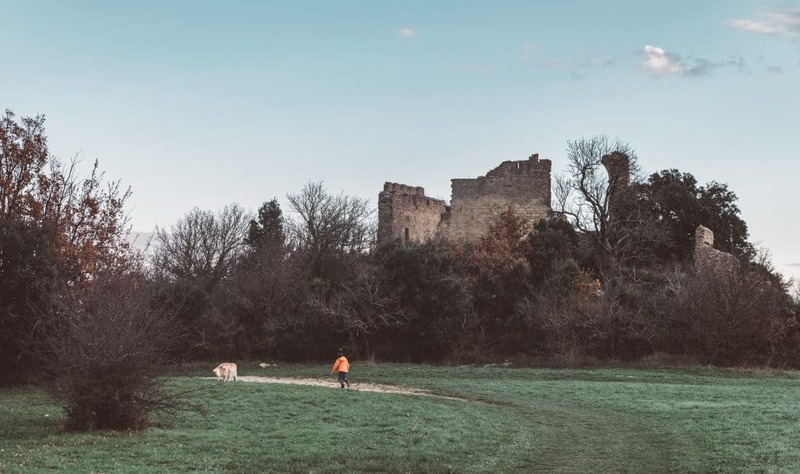 What’s more, this corner of France is castle country, and there are many imposing, impressive reminders of the region’s medieval past in the ruins of Hohlandsbourg and Fleckenstein. History looms large here, and the region is redolent with memories of the brutal wars and occupations of the 19th and 20th centuries. 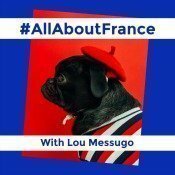 Nevertheless, despite the importance of the past in defining Alsatian culture and identity, this is a forward-looking, optimistic, and utterly unique part of France that will leave you wanting much, much more. Fiercely independent, with a weighty history and a rugged charm, Normandy is often considered within France as a place apart. This verdant region takes its name from the Viking conquerors that settled here in the 9th century (the name itself comes from ‘north men’ in Old Norse), and although the Normans have kept their fearsome reputation, visitors will always find a warm welcome. With gorgeous beaches, stunning architecture, and some of France’s finest seafood, this is a region with something for everyone. Norman history has always been tied to the sea, from the earliest Viking raids and the conquest of England in 1066, right through to the darkest moments of the Second World War. Today, some of the vast, expansive beaches of the Norman coast are places of pilgrimage, preserved as a memorial to the many men who lost their lives during the D-Day landings of 1944. Long stretches of golden sand, bordered by undulating dunes, also offer plenty of opportunities for summer fun, and families flock here in the summer months to relax, play games and dip a toe in the Channel. The same coastline is home to an abundance of picturesque ports and fishing towns, such as the beautiful Honfleur, arguably the prettiest harbour in the whole of France. This is the place to come for fabulous, fresh seafood, all washed down with a pint of local cider. The Norman dukes were medieval rockstars, and they left their mark in the shape of castles and cathedrals. The sublime Gothic churches of Rouen, Coutances and Caen are fitting monuments to this glorious past, as is the unique Bayeux tapestry, the first battle narrative to be told entirely in thread. 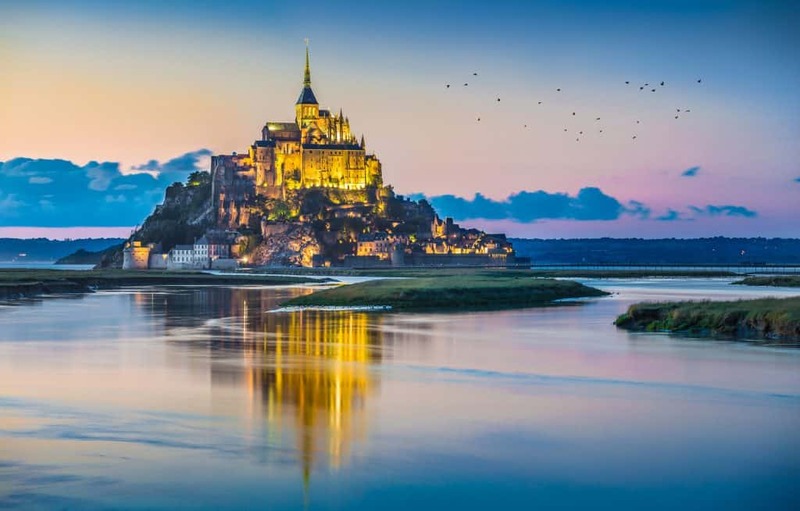 But the jewel in this region’s crown has to be Mont-Saint-Michel, the iconic abbey perched on a craggy rock high over the shimmering sands of the Couesnon estuary. It’s small wonder that artists and poets alike have found inspiration in this enchanting region; a visit to Giverny, where Monet painted his famous water lilies, is surely enough to see why. Rivalled only by the Champagne region, Bordeaux is one of France’s most important wine-producing provinces. Home to over 6,000 vineyards, this profuse and fertile region offers some of the world’s finest wines, building on an ancient culture that goes back nearly 2000 years. The area around Bordeaux is best explored on foot or by bike, and this lush, sun-soaked region certainly won’t disappoint. The city of Bordeaux is a pleasant destination for a city break, with its wide boulevards, 18th-century architecture, and riverside street culture. The city is a cultural hub, and visitors come here for the exceptional art galleries and museums, and renowned dining scene. The River Garonne, which snakes through the town centre, has been the focal hub of the city for centuries, transporting goods in and out of the city. It offers an ideal place for an afternoon stroll, lined with attractive cafes and restaurants offering refreshments for weary travellers. Outside the city, vineyards dominate the landscape, but Saint-Emilion, in the heart of the Bordeaux region, is an attractive spot for a day trip. This historic medieval village was founded in the 8th century when a pious hermit named Emilion, made his home in the nearby caves. Over time, the settlement developed into an important religious centre, and it’s possible to get a little closer to this rich history today by exploring the caves underneath the village. Wine production has been important here ever since King John of England established the Jurade, a wine-makers brotherhood committed to developing the industry in Saint-Emilion. Over 800 years later, Saint-Emilion still stands as one of the most important wine-producing areas in France. Whether you’re an aficionado of Bordeaux wines or not, this marvellous region has plenty to offer to visitors. 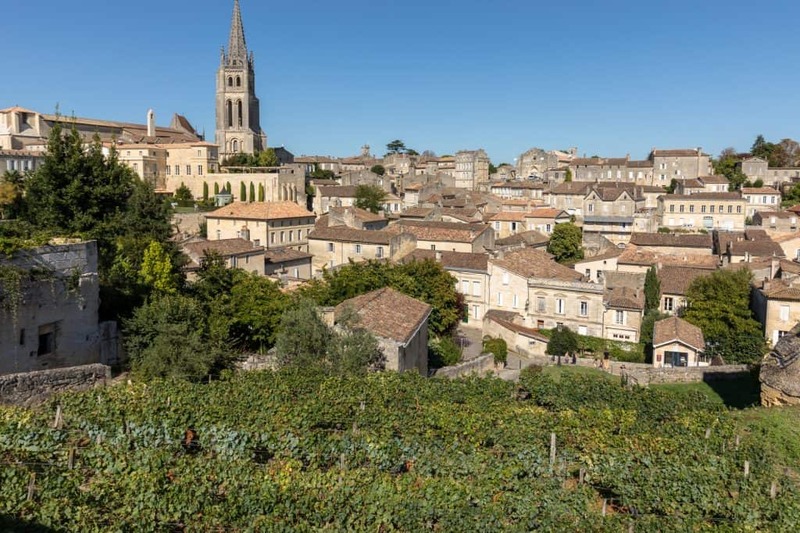 Book a day trip to Saint-Emilion from Bordeaux here. The French Riviera – summer retreat of the jet set – immediately conjures images of glamour, sophistication and style. During the summer months, French holidaymakers, along with an international crowd of celebrities and millionaires, flock to the Côte d’Azur, to dangle a toe in the Mediterranean and let their hair down in Monaco, San Tropez, Nice or Cannes. This is one of France’s most popular holiday destinations, and with good reason: the Côte d’Azur is truly stunning, comprising sandy beaches, vibrant markets, picturesque towns, coastal walking trails, and blazing red cliffs. Don’t despair if your wallet doesn’t stretch to long nights on the town in the fashionable resorts of St Tropez and Antibes or the casinos of Monte Carlo. 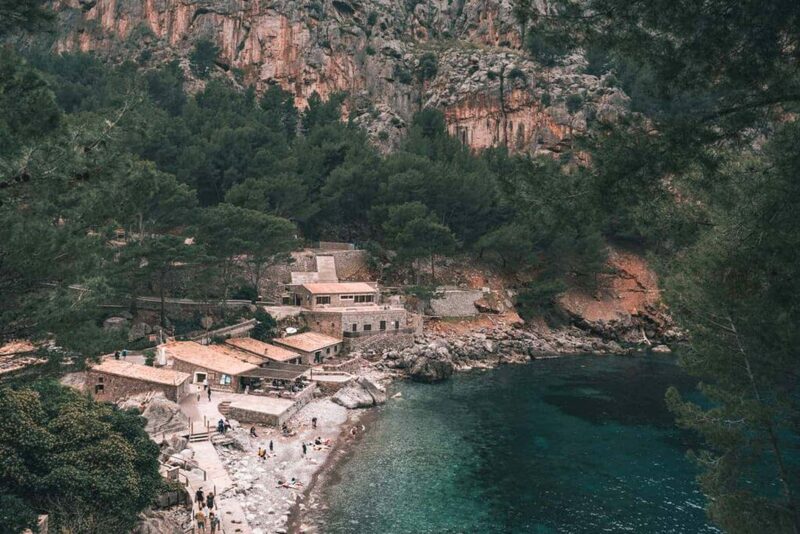 There’s more to explore here than many people realise, and this part of the French coastline is a natural paradise, filled with stunning hidden villages, nestled in the mountains that rise up from the sea. Saint Paul de Vence, for example, is known for its maze of labyrinthine streets, and vibrant artistic culture. This stunning village offers exceptional views of the coast and is a haven for photographers. Port Grimaud, the Venice of the Riviera, is characterised by its canals, waterways, and vibrantly painted houses. Finally, Èze, a charming medieval village perched on a high, rocky outcrop, offers the very best of the Côte d’Azur: exotic gardens, a medieval castle, and fabulous views of the Mediterranean. 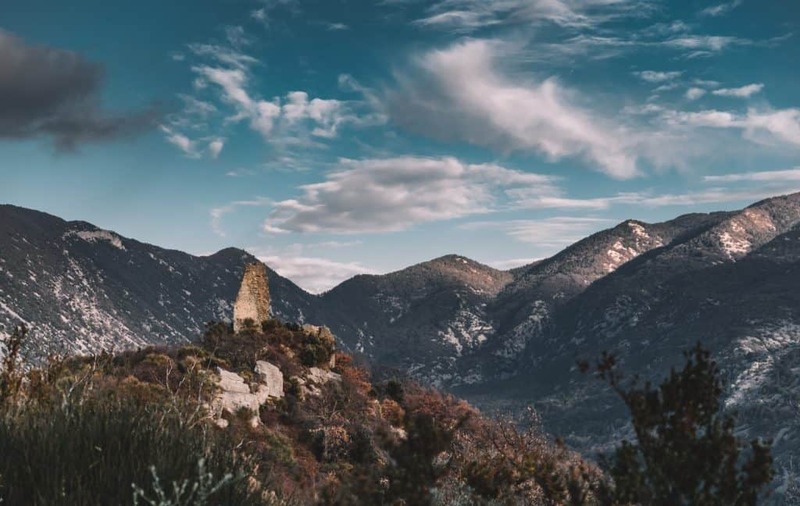 All the way along the coastline, beech forests and gardens of olives cloak the hillsides, making this an excellent spot for hiking or mountain biking. Come in the quieter months and you’ll enjoy warm sunshine, empty beaches, and turquoise seas: it’s easy to see why visitors return to the Côte d’Azur again and again. 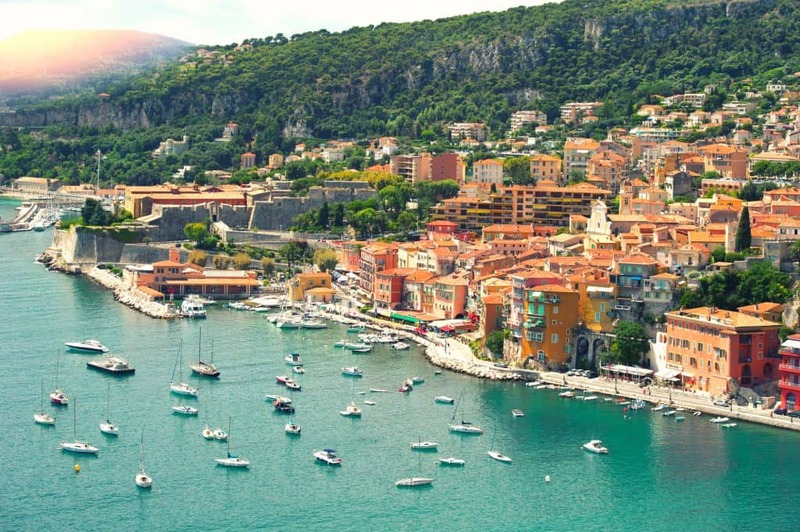 Explore the villages of the French Riviera with a tour. Burgundy, known internationally for its rich, full-bodied wines, is one of France’s lesser-visited regions. A trip here is an escape into some of the country’s most idyllic countryside, featuring rolling green hills covered in orderly vineyards, bright, yellow mustard fields, and tranquil canals. 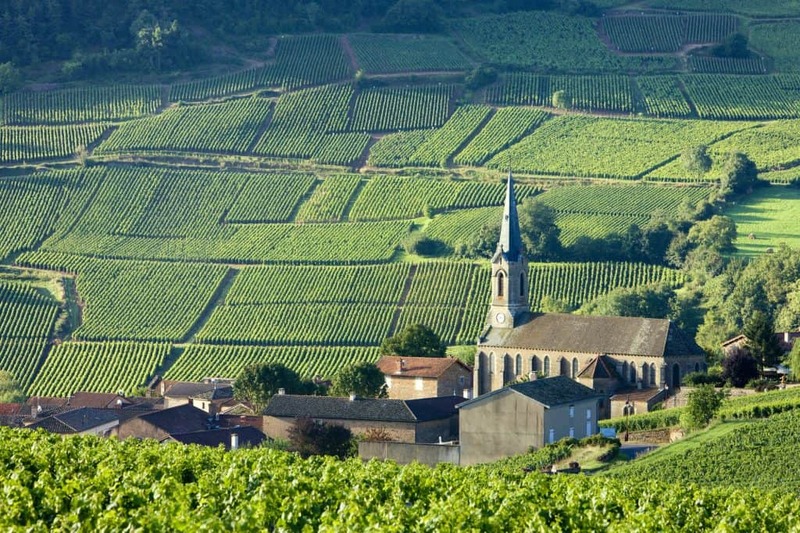 Burgundy’s vineyards are so important they have even been awarded UNESCO World Heritage status, in a nod to the richness and diversity of this significant wine-producing region. However, while a vineyard tour should definitely be on the agenda, this beguiling region has plenty of other treats to entice visitors. Dijon, the regional capital, was once the home of the Burgundian dukes, and their influence may still be felt in the stunning medieval and Renaissance architecture that makes up the city. The region’s fine produce is always on show here, and the fabulous Friday market at Les Halles is not to be missed, featuring local specialities such as Epoisses cheese, escargots (snails), and of course, the famous beef bourguignon. Outside the city, the countryside is littered with fabulous medieval monasteries, castles, and some of France’s most beautiful villages. The small, walled town of Beaune, with its cobbled streets, Gothic architecture and labyrinthine wine cellars has charm in abundance. This profuse, laid-back region offers plenty of activities for nature lovers. This is the place to hire a bike and spend the day weaving through the vineyards or drift lazily through the countryside in a canal boat, admiring the view. For walkers, the magnificent Morvan National Park provides over 1000 square kilometres of unspoilt countryside, filled with lakes, waterfalls, and atmospheric woodland. This is undoubtedly the French countryside at its finest. The Loire is France’s last untamed river, a 1000-mile-long, meandering natural habitat that humans have never quite managed to subdue. This aquatic highway has been left almost undisturbed over the centuries to shape the contours of the land that it flows through, and the Loire Valley, otherwise known as the ‘garden of France’, is the product of its meandering course. The Loire and its tributaries irrigate this fertile landscape, allowing it to bear some of the finest natural produce that France has to offer. The pace of life here follows the river, slow and relaxed, with seasonal bursts of activity. A visit to the Loire means two things: wine and castles. The fertile rolling hills of this green region offer perfect conditions for growing grapes, and vineyard tours and wine tastings are on offer wherever you go. The region is also dotted with impressive castles, many of which are set in marvellous gardens, overlooking small rivers. In particular, the Château de Chenonceau conjures images of fairy tales, with its elegant arches and towers, and a well-kept garden maze. Another highlight is the Château de Chambord, an immense structure that was built as a hunting lodge for the French king Francois I, set in grounds filled with deer and wild boar. This wild, sprawling castle continues to delight visitors and is thought to have been inspired by sketches by Leonardo da Vinci. The stunning fortified towns of Amboise and Chinon both include their own castles, and provide an excellent base for exploring the wider region. Chinon is a particularly good stop for wine lovers, as it is one of the Loire’s main wine producing areas, but this pleasant medieval settlement has many other things to offer, including a beautiful old town with distinctive slate-topped houses. Here, it’s also possible to hire bikes, and set off to enjoy the slow beauty of the Loire Valley on two wheels, at your own pace. 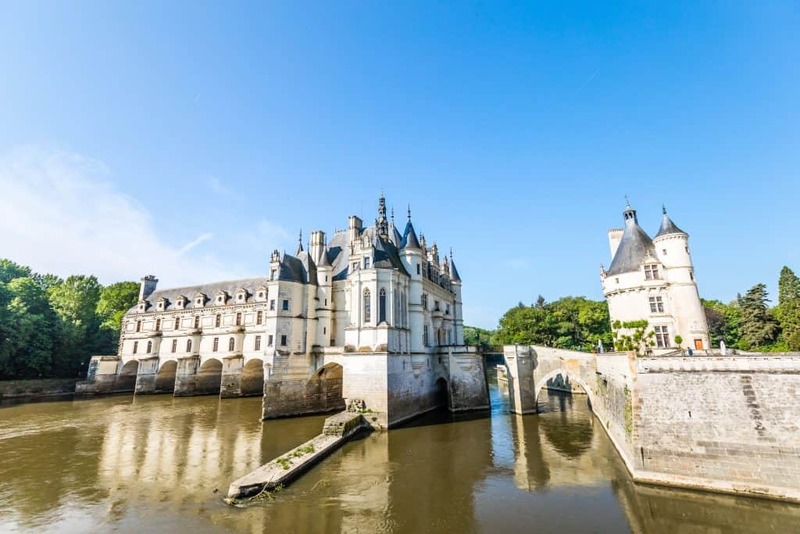 Book a day trip to discover the gems of the Loire Valley here. 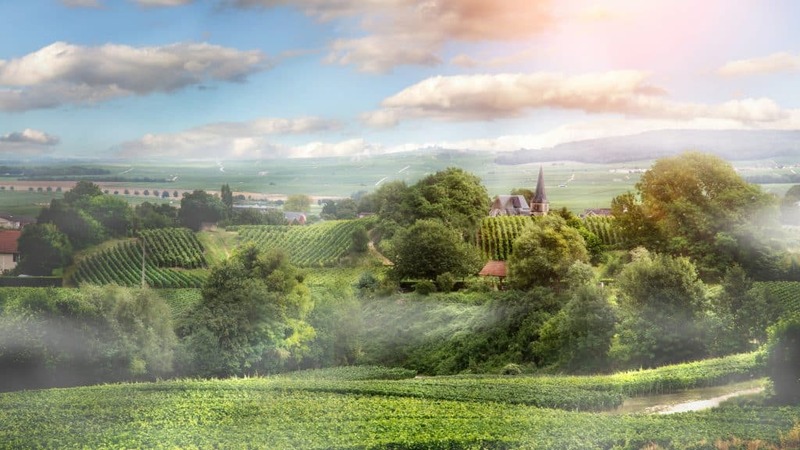 Just a stone’s throw from the capital, yet half a world away: the green, lush region of Champagne is one of France’s most iconic spots. This is the region that gives its name to those delicious, sparkling wines that have become an international marker of class and sophistication, and it’s impossible to come here without sampling a glass or two. Winemaking in Champagne has a fascinating history, and there are plenty of opportunities to explore the processes, techniques and produce that go into making this quintessential French export. Épernay, the regional capital, is the perfect base from which to set out into the vineyards; just be prepared to return with heavy bags and an empty wallet! Away from the wine trail, the Champagne region exudes old-world charm, and wandering through its beautiful villages and towns often feels like a step back in time. In fact, Champagne is a place with a visceral connection to its medieval past. In stark contrast to the glitzy image that surrounds the Champagne wines, this is a region of peace, calm and simple pleasures, where artisans and winemakers use traditional processes dating back centuries. Troyes, an important settlement since the Roman period, features stunning medieval architecture, historic churches, and traditional timbered buildings lining its narrow streets. The regional capital, Reims, is a triumph of Gothic architecture, and its breath-taking cathedral was once the site where the kings of France were crowned and anointed. Although it suffered extensive damage during the two world wars, Reims has been painstakingly restored in harmony with its medieval past, making it a lively, pleasant starting point from which to explore the wider Champagne region. 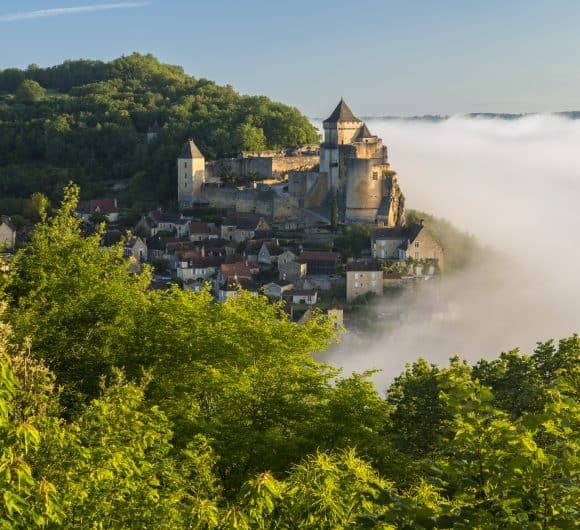 The Dordogne River snakes and weaves its way from the high mountains of the Auvergne, down to some of the finest countryside that France has to offer. Passing by dramatic fortified castles, perched precariously on high cliffs, the river continues through Bergerac until it meets the Garonne River at Bordeaux. 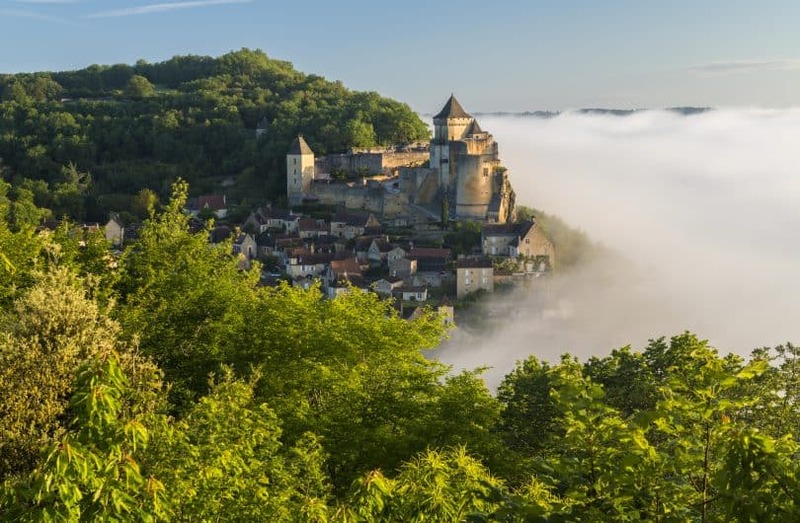 In between, the green and fertile lands that make up the Dordogne Valley offer a treasure trove of delights for visitors, both above and below the ground. Traversing the Dordogne and Lot involves, by necessity, an encounter with a very ancient past. More prehistoric remains have been found here than in any other part of France, providing a unique glimpse of the earliest origins of human society. 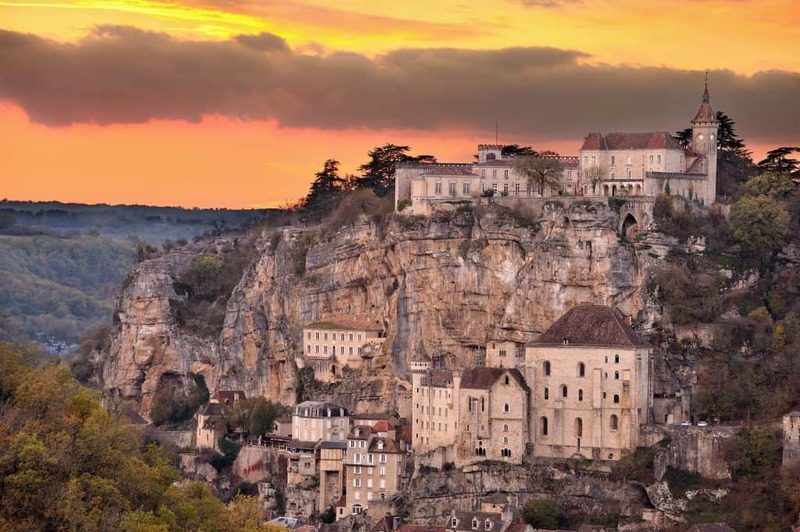 In the Vézère Valley, over 200 separate Palaeolithic sites have been identified, and it seems that the prehistoric inhabitants of this beautiful region were attracted by the natural protection afforded by its limestone caves. The jewel in the crown is the fabulous site at Lascaux, where, 17,000 years ago, early humans covered the walls of the cave complex with a series of incredible paintings. More ancient still, however, are the glittering caves and grottos that may be found deeper beneath the ground. This region is littered with incredible rock formations, formed over millions of years, with stalactites and stalagmites that have merged into epic pillars, creating natural, subterranean cathedrals of sparkling rock. Above ground, the Dordogne and Lot regions have even more treats on offer. The beautiful medieval settlements of Rocamadour, La Roque-Gageac and Sarlat-la-Canéda are well worth a visit, as are the castles at Beynac and Castelnaud. These picturesque villages and fortified chateaux, constructed in golden stone, are set within glorious natural scenery, with abundant wildlife and birdlife. There’s plenty here to keep active families occupied, with hiking, climbing, cycling and canoeing on offer throughout the valley. The ideal France holiday destination, this region is a little slice of heaven on earth. Book your Dordogne tour from Sarlat here. The Languedoc covers the southwest corner of France, a vast, sprawling region crammed full of fabulous treasures. The ‘langue d’oc’, literally means the ‘language of yes’, and refers to a medieval French dialect that fostered a rich literary and poetic culture during the Middle Ages. This was the home of courtly love, the chivalric ideal, and the epic Romance legends of King Arthur, and it’s clear that these medieval glory days have left a deep and profound mark on the culture and landscape. The Languedoc coast, unlike its Provençal neighbour, feels wild and unkempt and offers countless opportunities for exploration. This is the ideal place to toss out the maps and get lost – you never know what you might discover. The cities of the Languedoc, including Toulouse and Montpelier, are known for their pleasant boulevards and squares and laid back atmosphere. The ‘pink city’ of Toulouse, so named for the terracotta bricks used in its construction, offers bustling markets and a vibrant music scene and is an ideal jumping off point for the rest of the region. Towards the foothills of the Pyrenees, the sanctuary of Lourdes, where the Virgin Mary is said to have appeared in 1858, attracts millions of pilgrims every year. Pilgrims of a different kind arrive at the small town of Rennes-le-Chateau, seeking answers to a conspiracy theory that has raged for decades. The southwest French coast, stretching from the Camargue to the Côte Vermeille, next to the Spanish frontier, is exceptionally varied, including vast, sandy beaches, marshy wetlands, and pink, rocky outcrops. This wild coast is home to fabulous sea life and many species of birds, making it an ideal spot for nature observation. Oysters and mussels are the local specialities, and in season, you can eat them directly on the beach: seafood doesn’t come fresher than this. The pleasant waterfront town of Sète, with its seaside corniche and atmospheric canals, is one of the best places in France to sample the catch of the day. Further inland, the landscape is dramatic, featuring imposing cliffs, gorges and valleys, chestnut forests, and vineyards, punctuated by some fabulous medieval architecture. 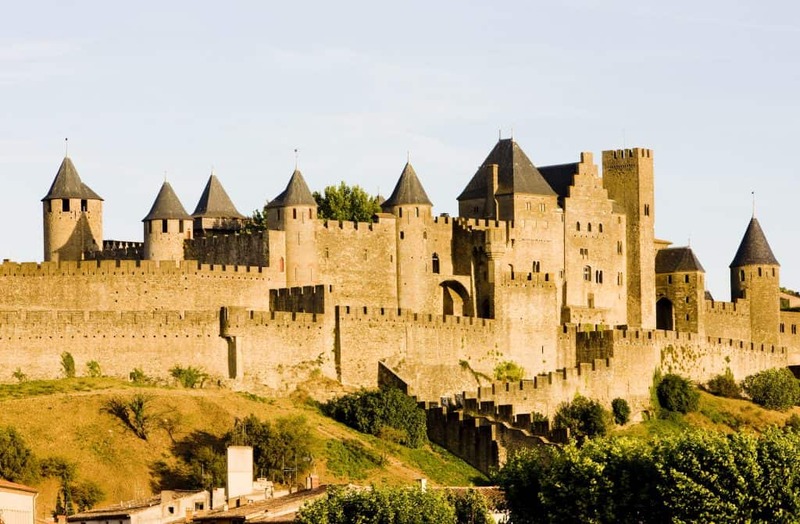 The fortified city of Carcassonne, once the stronghold of the Cathar heretics who rebelled against the king, is truly breathtaking and not to be missed. 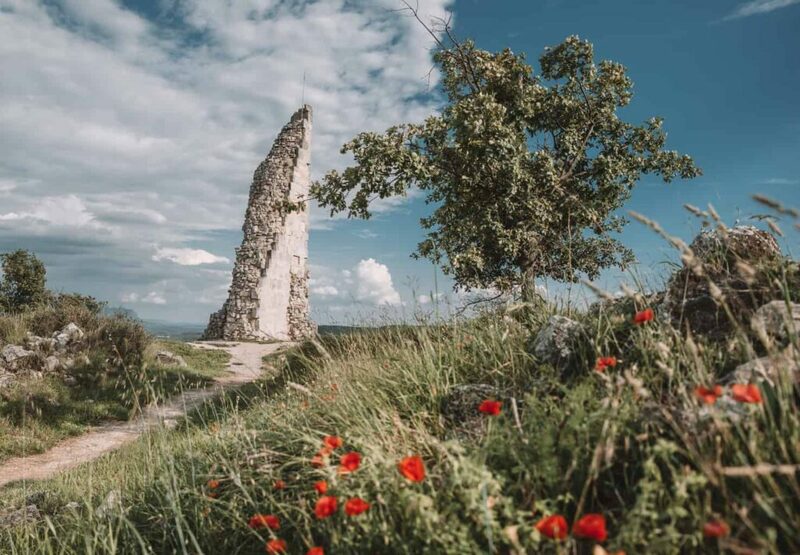 However, Carcassonne was not the only stronghold left behind by the Cathars, and it’s still possible to visit the dramatic ruined vestiges of Montségur, Quéribus and Peyrepertuse for an atmospheric evocation of the medieval past. The Languedoc has long been a historical crossing point, the meeting place of different cultures, languages and even religions. These diverse influences have produced a rich and distinctive culture, making this one of France’s most rewarding regions for curious travellers. Discover the delights of the Languedoc on a guided tour. Provence, the delightful region that envelops the Côte d’Azur, is a heady assault on the senses. 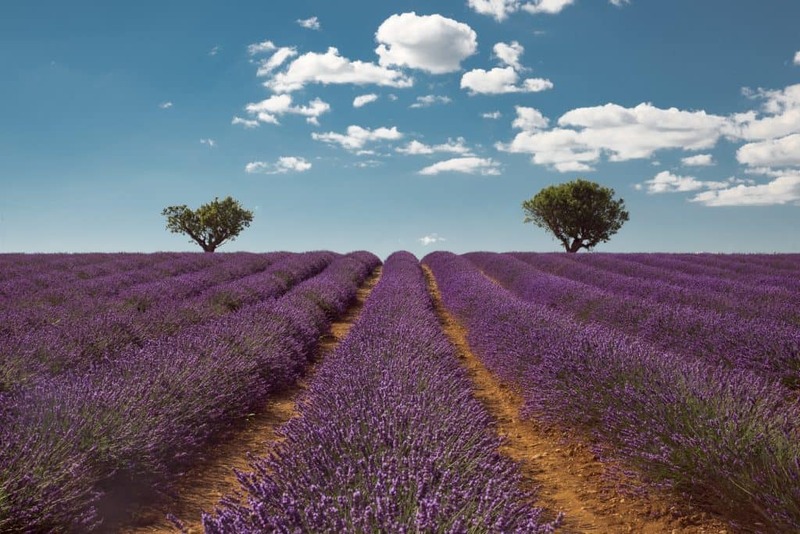 Rolling fields of bright, purple lavender, rows of vines stretching into the horizon, and gorgeous groves of twisted olive trees mark out Provence as a true garden of delights. Aix-en-Provence, the elegant regional capital, brings a touch of this rural sensuality to an urban setting, combining leafy courtyards, sculpted stone buildings, and wide boulevards strewn with terraces where visitors can while away the hours and watch the world go by. The city’s colourful markets bring together the very best of Provençal produce, in a vivid display that is sure to whet your appetite. Avignon, one of Provence’s main cities, also offers visitors plenty of things to see and do. For the better part of the 14th century, the papal court was based at Avignon, and in this period, popes were not known for their restraint. The Avignon popes set about building a lavish palace, which stands to this day, complete with magnificent frescos. The city also features several excellent museums, the famous Pont d’Avignon, and an annual arts and theatre festival that attracts an international crowd. However, Provence’s most enticing charms are found outside the main urban hubs, in the countryside. Picture-perfect medieval villages such as Venasque, Uzès and Gordes offer ample opportunity for exploration, featuring cobbled streets, golden stone architecture, and green, mountainous backdrops. Les Baux de Provence is perhaps the finest example of restored Provençal village architecture, with its own citadel and a fearsome reputation for gastronomy. Provence is also home to an abundance of wildlife, supported by its diverse range of natural habitats. In the southwest corner of the region, the green hills drop away to a vast wetland in the Rhône delta. The Camargue National Park includes herds of wild, white horses, roaming bulls and flocks of startling pink flamingos. This unique, beautiful area is best explored on foot or on horseback and is certain to leave a big impression. Book your day trip from Aix-en-Provence here. 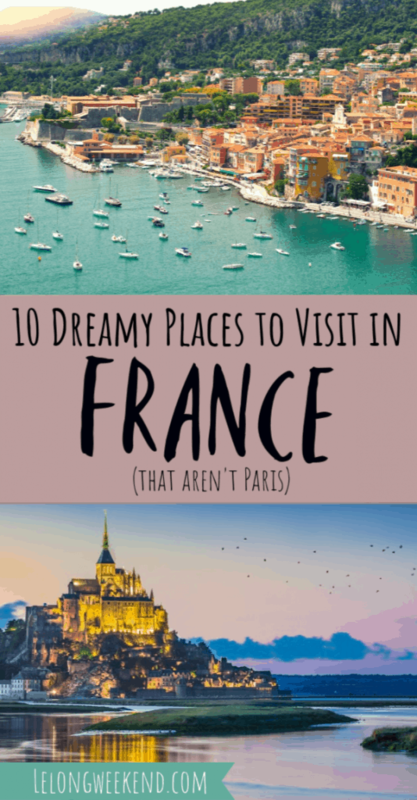 Trying to experience the best of France on your own can be a fun and rewarding experience. But to truly get to know a destination, I usually recommend taking at least one tour with a guide who is genuinely passionate and knowledgeable about the area. Imagine being led through a landscape laced with vineyards, to learn the intricacies of winemaking direct from the source. Or wandering through ancient city lanes, pausing to examine archaic art etched into walls that you would have otherwise overlooked. It is personal and authentic experiences like these that French tour company Ophorus pride themselves on. They excel at helping you discover the very best of France, their home, in a relaxed and friendly way. Ophorus guides lead the pack when it comes to delivering meaningful encounters; their expert and in-depth knowledge, delivered in a professional yet approachable manner, has earned them the highest praise from past tour attendees. The company’s commitment to excellence has also awarded them a coveted spot in the TripAdvisor Hall of Fame for 5 years running! France is a magically diverse country, full of surprises and closely held secrets. I encourage you to explore further than the top France attractions, to discover the country that has inspired so many. *This post has been bought to you in partnership with Ophorus. As always, Le Long Weekend maintains full editorial control of the content published on this site. Beautiful beaches may be a given when visiting an island in the Mediterranean. But is it possible to still find true hidden gems? Beaches untouched by mass tourism and hidden away from the public eye? 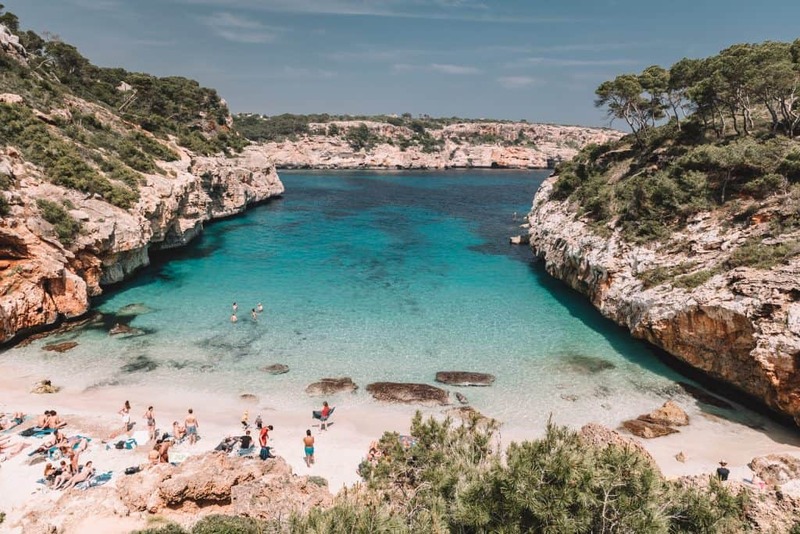 With a little perseverance and a lot of scouring Google Maps, I’ve done the hard work for you to find 10 incredible Mallorca beaches that deserve the title of most beautiful. Some are situated on the edge of a small town, others are completely wild in their surroundings, but all have something special about them. Let me introduce you to (in my opinion) the top 10 beaches in Mallorca! Mallorca is a remarkable island, and as such it’s becoming increasingly popular with holidaymakers. It’s important, especially when visiting the hidden beaches of Mallorca, to respect what makes them so special in the first place. Their natural beauty. Take supplies with you. Many Mallorca beaches in this list do not have shops nearby. More importantly, take everything back home with you. This includes any rubbish you’ve created during your stay. You won’t necessarily find trash cans nearby, so you’ll have to take it with you to dispose of/recycle later. Bring a spare bag for this purpose. Wear reef safe sunscreen if you plan on swimming to protect the delicate underwater eco-system. Bring sturdy footwear for navigating sometimes difficult terrain to and between the beaches. Respect the local communities – park in designated spots, even if it costs you a few euros to do so. Be considerate of others. Some of these beaches are very small. So perhaps save the hefty sun umbrella or Bluetooth speaker for beaches where you won’t be ruining someone else’s fun. I’ve created a map of the best beaches in Mallorca to help you navigate the island. Be sure to click on the icon to check the address of each beach. Cala Barques was the first beach we visited in Mallorca. We arrived on the ferry from France at the ungodly hour of 6am and although we’d arranged an early check-in to our Airbnb, we still had a few hours up our sleeve to kill. We decided to head to the small resort of Cala Sant Viçenc to watch the sunrise. Cala Sant Viçenc was one of the places I was thinking about staying when we were booking our trip to Mallorca, so I was curious to check it out. Separated from the large resorts around Port de Pollença and Port d’Alcudia (where our ferry docked) by a large mountainous ridge, it hinted at being a laid back spot to enjoy the island. On a sleepy Sunday morning, it was certainly quiet, and we were the only souls on the street. We parked near Cala Barques and wandered down through the beachside restaurants and past quiet hotel lobbies to the beach below. It was a beautiful time of day to discover this serene beach. Goats took centre stage as they sauntered across the sand and climbed the impossibly steep beachside cliffs. Bleating all the while. With time to spare, we wandered over to the left side of the beach where you can walk past a little boat hut and up to another vantage point. On the other side, you can walk around the headland to find two other beaches in close proximity. The petite Playa de Cala Clara and Playa de Cala Molins which feels a little more built up than Cala Barques. What makes Cala Barques one of the best beaches in Mallorca? We loved that this Mallorca beach still felt a little wild. The goats roaming around, the rocky landscape, and the fact that it was only built up on one side. I’m sure it’d still get busy in the height of summer, but there are other beaches you can walk to if you’re seeking a little more solitude. Cala Barques was one of the easier beaches to reach. Located at the end of the main road in Cala Sant Viçenc, I’d recommend finding a park wherever you can and then walking the straight line to the beach. The car park at the end of the road may be open when you arrive (it was blocked off when we visited) but it’s likely to get full quickly in the busier months. I’d spotted Cala Varques on the satellite view of Google maps and was determined to discover it. What I didn’t realise, was just how tricky that would turn out to be! 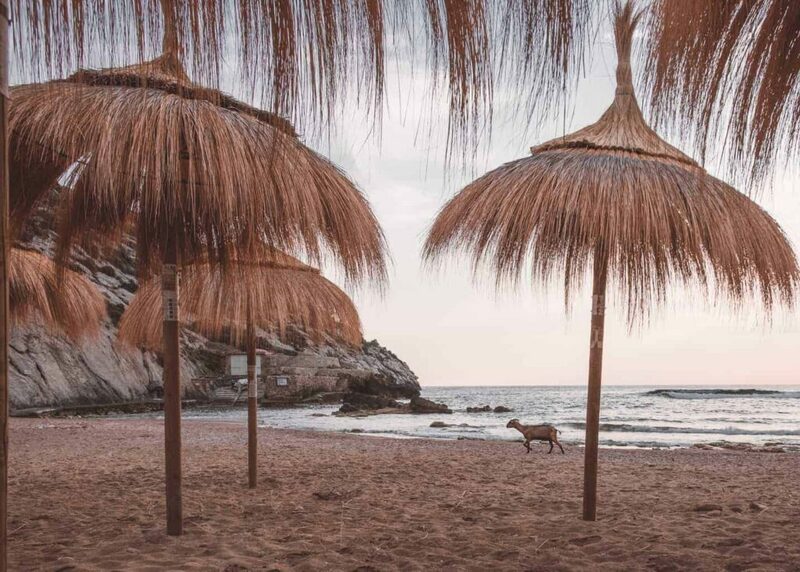 Let’s get this clear right off the bat, Cala Varques is not the most family-friendly of beaches in Mallorca. I’d go as far as saying that you shouldn’t even attempt to reach this beach with kids until they’re well capable of climbing! As it turned out, I didn’t realise this until we got near the beach, and so my husband and son stayed behind as I clambered over a 6ft wall, through a hole in the fence, and over a smaller wall to reach the dirt track to the sand. Once I found my way, I followed the path through the bush until it revealed the most picture-perfect beach before me. The beautiful white sand cove was unsurprisingly quiet, with people sunbathing and chilling under the mid-May sun. Several boats were moored in the bay, taking full advantage of not having to run the gauntlet faced by those arriving on foot. The water was incredibly clear and the low lying land surrounding the beach made it perfect for exploring further afield. 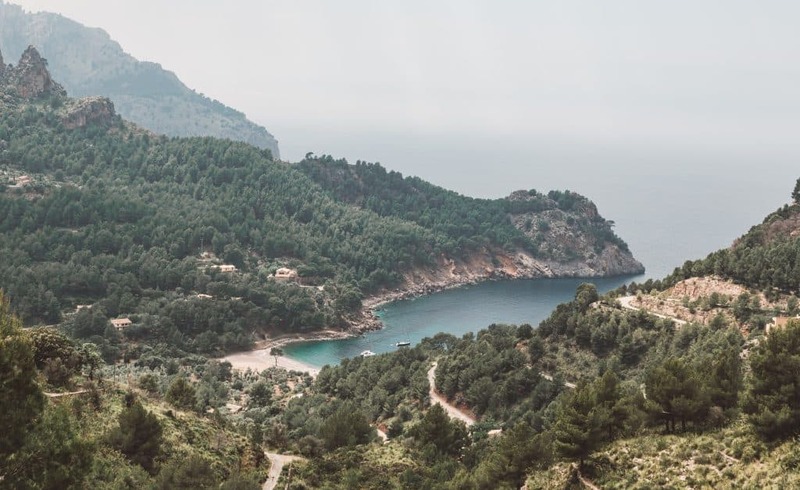 I had to pull myself away from the view to return to my waiting family, but it’ll be top of my list when I return to Mallorca – it was such a stunning stretch of coastline. 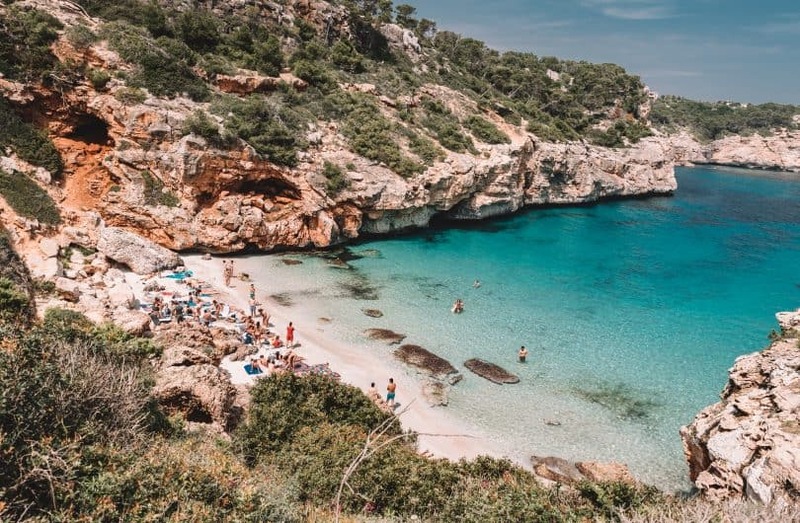 Why is Cala Varques one of Mallorca’s best beaches? Its inaccessibility makes this beach suitable for only the most intrepid of visitors to Mallorca. Which in turn, makes it a fairly special spot. 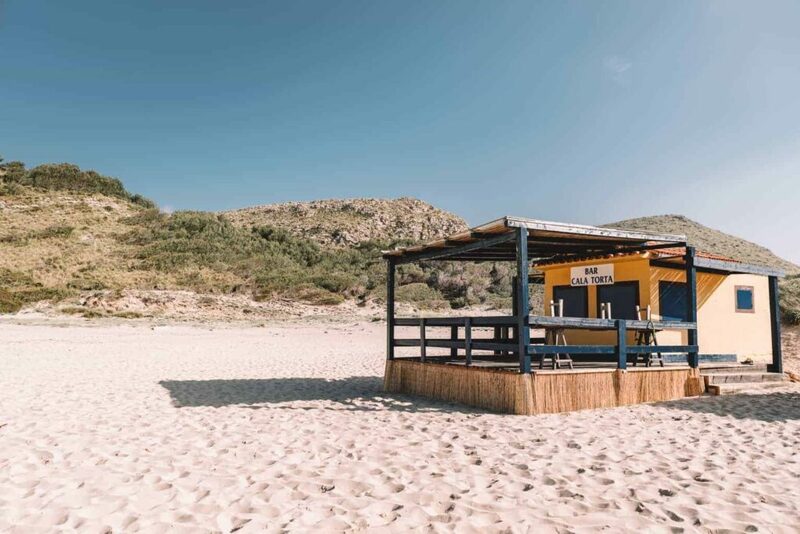 There is a small beach shack selling snacks and drinks (presumably brought in by sea) and the overall feeling is that of a laid back, chilled vibe. Perfect if you’re looking for a more ‘grown-up’ scene. It’s also one of the best places in Majorca for snorkelling! As I mentioned, getting to Cala Varques is no walk in the park. Don’t attempt to turn down the small road leading to Cala Varques on Google Maps. It’s narrow, parking is forbidden (although plenty still try), but most annoyingly it’s incredibly hard to turn around! Instead, park at the “Fig Parking Place” marked on the map and walk down. Once you get to the end of the road, you’ll be met with a closed metal gate. But don’t let that put you off. Instead, look for the star and arrow pointing to your right where you’ll need to scale the 6ft wall (easier than it sounds due to the conveniently placed rocks), through the field, and over another shorter wall. From here the walk is fairly self-explanatory. There’s a small hut selling refreshments on the beach, but little else. 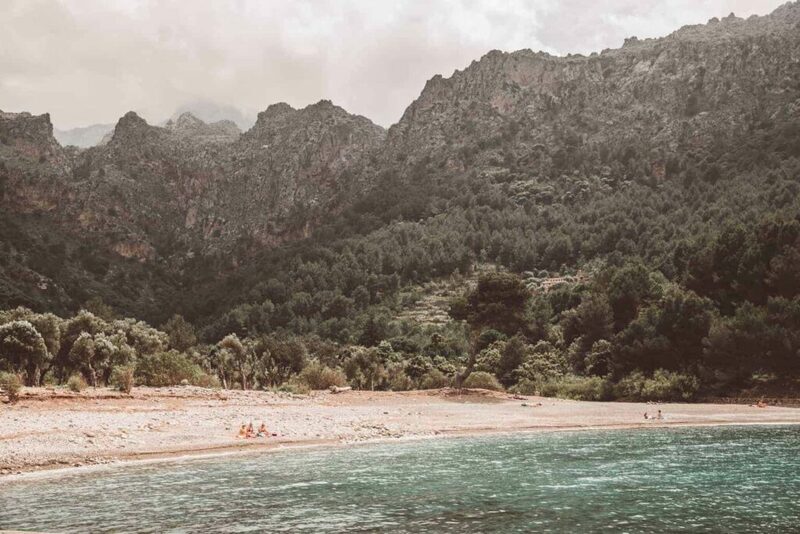 While Cala Mesquida doesn’t quite cut it as one of the most secluded beaches in Mallorca, it’s still relatively wild and rugged despite being located next to a fairly built up resort area. We decided to pop by on a whim on our way to Cala Torta (below), and I’m glad we made the diversion. Surprisingly, parking was free in this busy little town so we left the car and wandered down to the beach via the scenic staircase. I kept stopping on the way down to take photos as it was just so beautiful..
Once on the beach, the sheer number of beach umbrellas and sun loungers hinted at how busy it must get in summer. But yet it still managed to look amazingly natural with the surrounding dunes and untouched countryside framing the beach. A favourite for families, kids were happily wading in the shallow shoreline while their parents chatted nearby. Other groups had set up camp on the far end of the beach where the pearly white sand rolled uninterrupted into the sea. 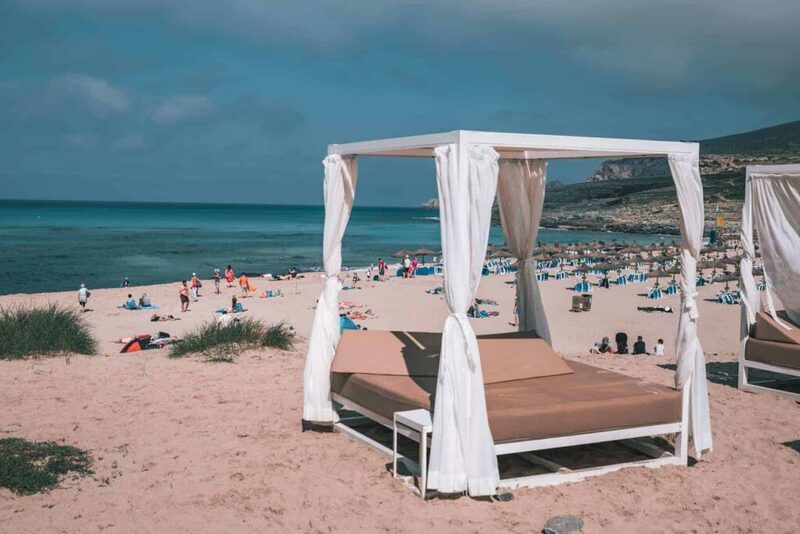 What makes Cala Mesquida one of the best Majorca beaches? Although developed, Cala Mesquida still manages to remain largely untamed and even wild on the far end of the beach. It’s proximity, yet separation, from the resort next door, means you get the best of both worlds. Relax on a beautiful, natural beach in the morning before heading up a flight of stairs to grab lunch at a nearby restaurant. If you’re holidaying with kids I’d recommend Cala Mesquida as one of the best areas to stay in Majorca. It’s small enough to not feel crowded, and there are plenty of places to stay in the area. 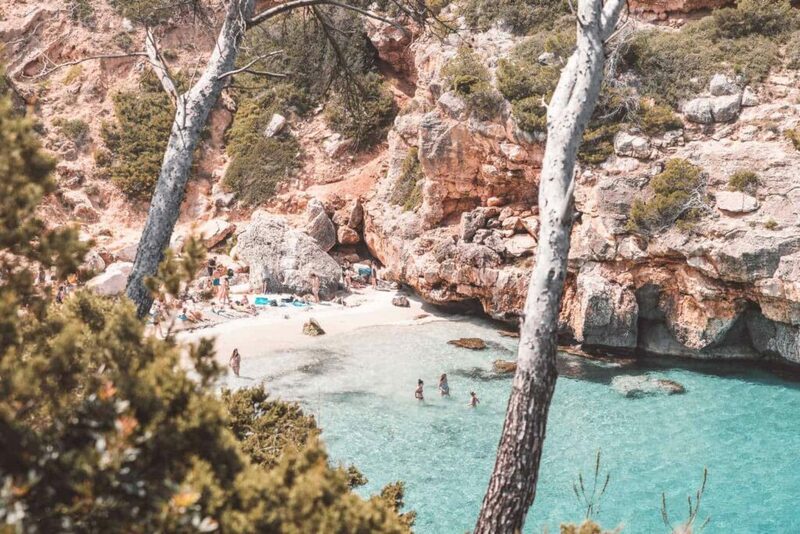 From here, you can also discover many other great beaches in the area such as Cala Torta (below) and the series of sandy coves up the coast to Cap Farrutx. Google earth is my planning buddy when mapping out holiday ideas. And it’s beaches like Cala Torta that hook me in from the first glance. From above, the beach cuts a deep slice into the landscape. It looked expansive and totally wild from the photos online, and I was determined to see if the reality met my expectations. Heading off from Cala Mesquida, we had to backtrack quite a way inland before veering back in the direction of the coast. And when we arrived, we found half a dozen cars in the dusty car park suggesting we weren’t the only ones with such an idea on this hot and dry day! Walking down the sandy funnel, we arrived at the beach to find a calm scene before us. Despite the cars we passed, the beach is large, and there’s enough room to accommodate plenty more people comfortably. As the afternoon wore on, local families continued to arrive until late in the day suggesting this was a favourite spot among those in the know. A young german shepherd pup playfully chased seagulls while we indulged in a lazy picnic lunch. Afterwards, I walked up and over the hill to peek at the neighbouring Cala Mitjana o S’Aduaia, but it lacked the same breed of charm that was bestowed upon Cala Torta and remained deserted despite its easily accessible location right next to a coastal road. 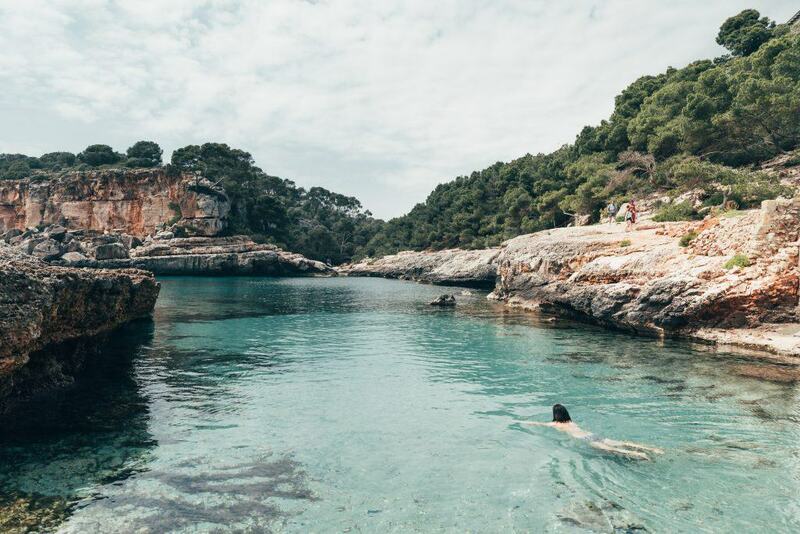 What makes Cala Torta one of the best secret beaches in Mallorca? Cala Torta remains totally unspoiled, despite being much loved by the locals. It’s a wide and deep beach, perfect for those who want to play a game of soccer or beach volleyball. And its position makes it a great spot to launch off on a coastal walk around the rugged coastline. I wouldn’t recommend taking a rental car to Cala Torta. The final 1km or so leg of the journey is down a gravel/dirt road with plenty of potholes. A 4WD isn’t necessary, but a good sense of adventure is! Parking is free. There’s a small beach bar that’s open in the summer months, but no other amenities are present at this secluded beach. 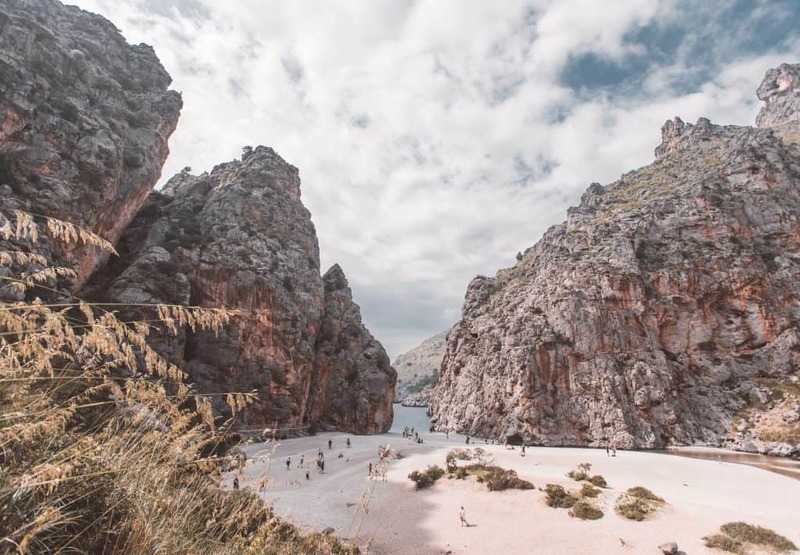 When I was looking for things to do in Mallorca, there’s one beach that really caught my eye – Sa Calobra. I was determined to visit, but as it’s a famously treacherous drive down, I wanted to see if we could make the most of our time on this part of the island by visiting some other beaches in the area. Enter Cala Tuent. The road to Cala Tuent stems off the main road to Sa Calobra. Once you’ve driven the worst of the sharp twists and turns, the turnoff is on your left. From here, the road was much more manageable and surprisingly quiet. We stopped at a viewpoint on the way down to appreciate the scene from above. Carrying on down the road we managed to park very near the beach, on the side of the road. Cala Tuent really feels like a hidden gem tucked between towering mountains. It’s undeveloped, apart from a lone beach shack, and totally tranquil. The day we visited, there were only a handful of people on the beach, unlike the much busier Sa Calobra next door. Wander behind the beach to visit the curious farmyard animals that live among the olive trees. The horse will gladly relieve you of any spare apples! 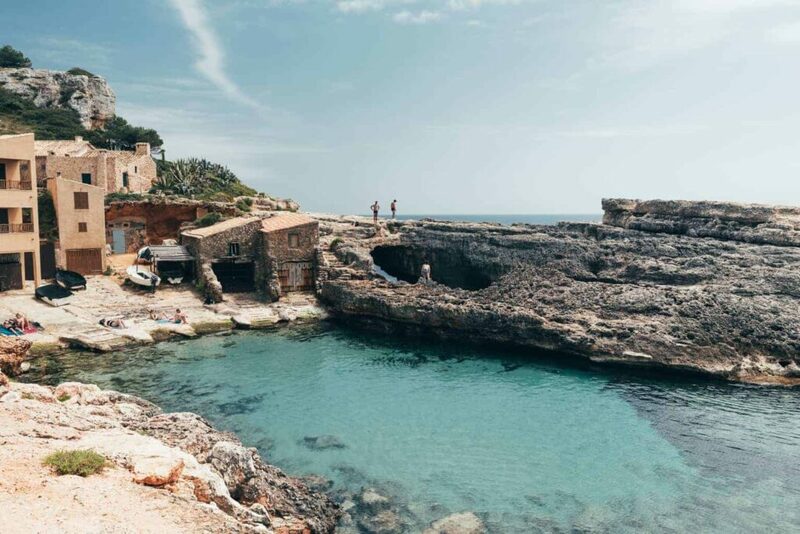 Why is Cala Tuent one of the best places in Mallorca? The setting really makes this beach stand out among the others. It’s a little harder to get to, but the journey is well worth it. Plus, the water in this inlet had a really special colour – it was the most incredible teal/green, and in usual Mallorcan style, it was beautifully clean & clear. As mentioned, the road to Cala Tuent isn’t a walk in the park. It is well maintained, and well signposted, but it’s full of twists and hair-raising turns. So if you (or your kids) get car sick, this may be one to leave off the itinerary. Once you’re at the beach, there’s little more to do than relax with a good book. Car parking near the beach costs €5/day or €1/hour. As I mentioned, Sa Calobra was high on my list of places to visit while on Mallorca. Not only for the beach itself but also for the infamous drive to get there. I’d read accounts of how terrifying the road to Sa Calobra is, and it’s certainly not for the inexperienced! But in reality, if you’re a fairly confident driver who is used to driving on narrow European roads, there’s nothing to fear. We set out from our centrally located accommodation mid-morning, and even though it was an overcast day, it was clear we weren’t the only visitors headed for this unique beach. The skinny road was swarming with cyclists and I admired their determination as they tackled the menacing mountain before them. Turning off towards Cala Tuent, we had to backtrack back over the hill to reach Sa Calobra afterwards. Luckily, this meant the crowds had thinned a little as the tour buses were departing for the day. When you reach Sa Calobra, you’ll have to pay for parking, which is considerably steeper than over the hill at the lesser-known Cala Tuent. But we paid our dues and set off down to the water. The first spot you reach is quite built up, but the small pebbled beach is very picturesque in its own right. Wander further down the path to your right and eventually, the tourist shops and cafes will give way to a rustic and unspoiled view. Follow this route around the bends and through dimly lit tunnels until you reach the spectacular Sa Calobra beach. Flanked by two towering cliffs that only rebellious goats would have the gall to climb, it really feels like you’ve reached somewhere special. And even on an overcast day, it was easy to appreciate its beauty. Why is Sa Calobra one of Mallorca’s best beaches? It’s no hidden gem, but it would be remiss to not include Sa Calobra one of the top beaches in Mallorca. I love that its position, tucked away in nature, means it’ll never be developed. And it’s this tranquillity that really adds to its charm. The dramatic landscape is the perfect setting for a day at the beach, and it’d also be a pretty sweet spot to moor your yacht if you’re that way inclined! The road to Sa Calobra is a difficult one, so take it easy on the way down. Once you arrive, you’ll have to park in the paid lots which charge you hourly. We were there for under 3 hours and paid €8.60 – which had to be paid in cash. Follow the signs to Sa Calobra past the cafés and shops, but know that once you get there, there aren’t any facilities close by. There seems to be a correlation between how hard a beach is to find in Mallorca, and its beauty! Caló des Moro was another beach that initially eluded us, as the track to reach it is quite inconspicuous. However, this little nugget of a beach was worth the journey. We parked at the southern end of Cala Llombards, quickly snapping up the last car park near the entrance to our walk. Initially, we headed in the direction of Cala s’Almunia. And after exploring the beach here for some time we wandered up over the cliffs to find Caló des Moro. As the beach is situated within a private reserve, there’s a fence to walk through which initially threw us off. But after watching a few others saunter through it, we tentatively did the same. A short walk down a dusty path, delivered us to the beautiful Caló des Moro. I initially decided to walk past the beach and around the headland to get another view of the area, and it was incredible! On one side you have the small but perfectly formed beach, and on the other, the sheer cliff gives way to the endless Mediterranean sea. The path leading down to the beach is steep and unforgiving and could be tricky if navigating very young children. This is not a beach for a family day out, but rather a secluded space to snorkel, sunbathe and soak up your surroundings. 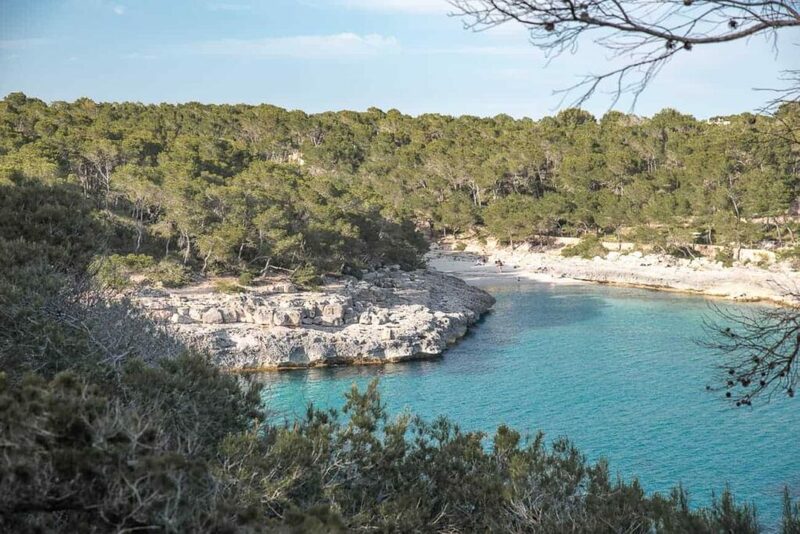 What makes Caló des Moro one of the best beaches in Mallorca? The beach and its surrounds were once destined to be turned into a holiday resort. Seeing what damage had been done in other parts of the island, a local family decided to step in and save the once quite derelict spot from its fate and turned it into a sanctuary instead. Their careful preservation of the land really shows and it’s a testament to their love of the area. Its seclusion and advantageous position certainly help position it as one of the (if not the) most beautiful beaches in Mallorca. It’s advisable to set out for Caló des Moro in the morning, as parking is in short supply. And even when you do snap up a car park, you’ll most likely be faced with a bit of a walk. As you approach the end of Carrer des Caló des Moro, you’ll find a sign to Cala S’Almunia beach and a set of concrete stairs to descend. You can get to Caló des Moro this way – via Cala S’Almunia – and around the headland. Or, just before you reach the aforementioned staircase, you can look for the stone wall with a low wooden gate marked “privado”. Against your better judgement, this is, in fact, the proper way to Caló des Moro and you won’t be chased off the property by an angry proprietor – just make sure you go through the right gate! 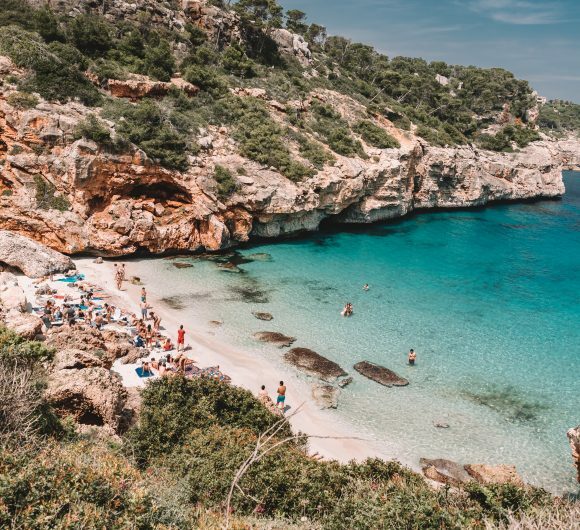 As with the other secret beaches in Mallorca, there are no facilities once you get to the beach, or in the immediate surroundings, so take what you need with you for the day. S’Amarador beach wasn’t really on my radar when we visited Mallorca. But I’m always drawn to the natural beauty found in nature parks and so the Mondragó Natural Park caught my eye when I was looking for a good walking spot on the island. We drove to the edge of the park and left our car in a shady car park before proceeding on foot. The walk was indeed spectacular as it cut through the low lying shrub and windblown pine trees. Occasionally the bush would reveal a peak of the teal blue water that was waiting in the distance. As we neared S’Amarador beach, there was a viewpoint looking over the bay and it’s a vision that has stuck with me ever since. The turquoise sea and bright white sand perfectly complemented the rust coloured cliffs and sage green shrubbery that surrounded the scene. Yachts were moored offshore – hosting afternoon drinks or serving as a pit stop for swimmers. We continued around the bend to the beach, which was busy but not crowded. We set up shop on the sand and settled in for an afternoon in the sun. Around us, people swam in the shallow water, played frisbee on the beach, or relaxed with a beer from the beachside bar. This beach has more of a family-vibe and there is plenty of space to spread out. From S’Amarador beach you can wander along the path etched into the cliff to Cala Mondragó. Although still pretty by anyone’s standards, Mondragó is smaller, more built up (has a restaurant right on the beach), is busier, and generally just lacked that little something ‘extra’. Why is S’Amarador one of the top beaches in Mallorca? 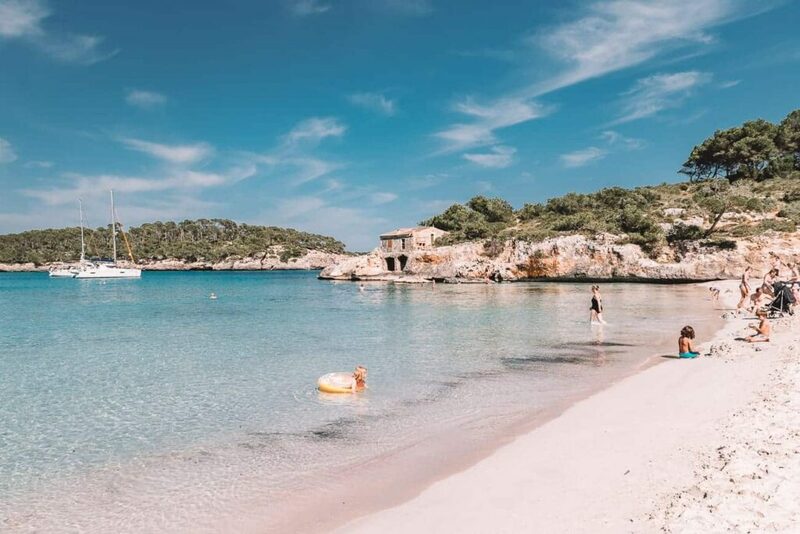 When you’re surrounded by nature, overlooking a calm, clear bay, with yachts floating completely still on the horizon, you’ll be left with no doubt why this beach in Mallorca is one of the most beautiful on the island. Its privileged position within a natural park helps aid its allure also. S’Amarador is a great beach for kids too, with its shallow and safe swimming conditions. The best way to reach the beach is to park at the car park on Strand Cala Mondragó, Parkplatz, and proceed on foot. There is a fee to park here, which was €5/day when we visited, but this is donated to charity. You can walk directly to the beach, or take the more scenic coastal path which branches off to your right. I’d highly recommend this option if you’re able! 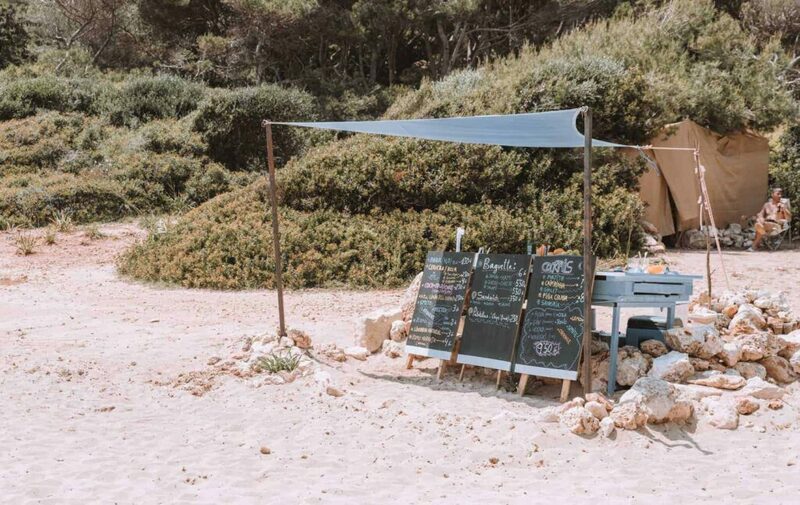 Once you reach the beach, there’s a beach bar selling food & drinks. And toilets are available. I mentioned that Cala Mondragó wasn’t one of my favourite beaches, but there’s more to be discovered around the coast from S’Amarador! 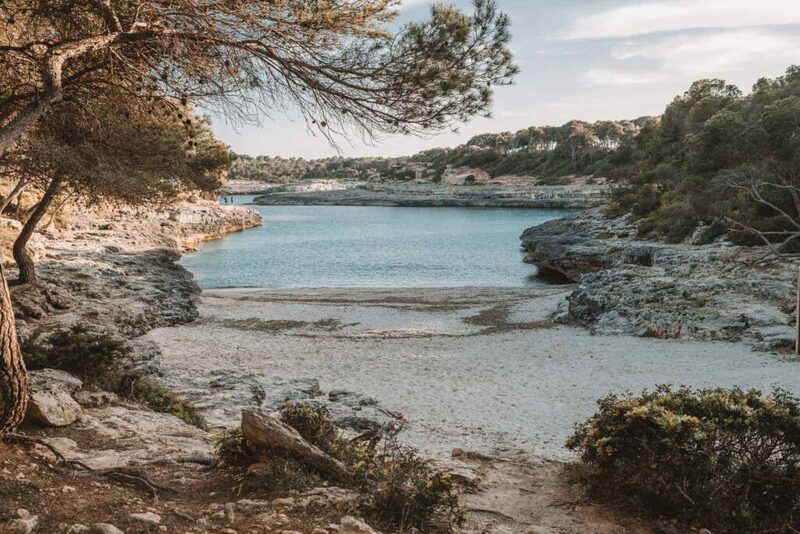 Keep walking past the nook that houses Mondragó beach, around the headland and through the thick bush, and you’ll eventually land yourself at Cala d’en Borgit. We arrived late in the afternoon to find just one other person enjoying the beach. Granted, the sun had moved on from this sheltered spot and probably taken the last of the sun worshipers with it. But I could see its potential as a fabulous sandy nook tucked away from the busyness, and I was kicking myself for not finding it earlier in the day. 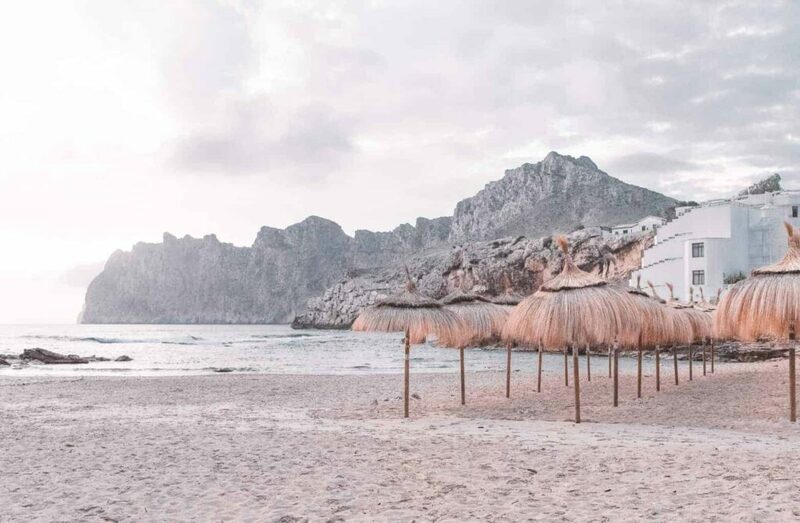 What makes Cala d’en Borgit such a special beach in Mallorca? Its seclusion, its somewhat secret nature, and its surroundings. It’s the beach to head to when you want a slice of paradise all to yourself (well, almost..). From S’Amarador take the coastal path to Cala Mondragó and then continue around the headland until you reach Cala d’en Borgit. You’ll get an amazing view of this little beach as you round the bend! There are no facilities at this beach, but it’s not far to walk back to Cala Mondragó if you need food/drink or bathroom facilities. 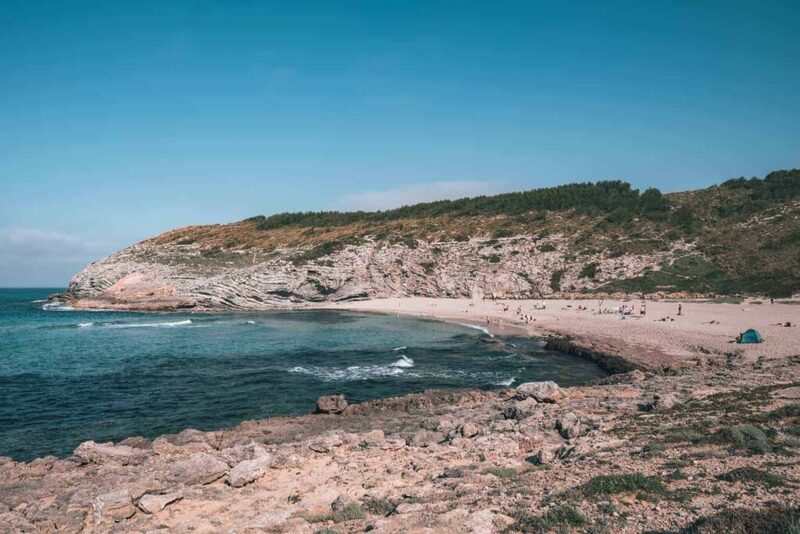 The day we stumbled upon Cala S’Almunia, we’d initially set out to find another beach altogether – Caló des Moro. We did eventually find our destination, but not after taking our time to explore the delightful Cala S’Almunia and its surrounds. Walking down steep stone stairs delivered us into a shallow bay surrounded by a rocky coastline. To our right was a small sandy bay, only big enough for the few sunbathers resting on its shores. And to our left was the petite settlement surrounding Cala S’Almunia. 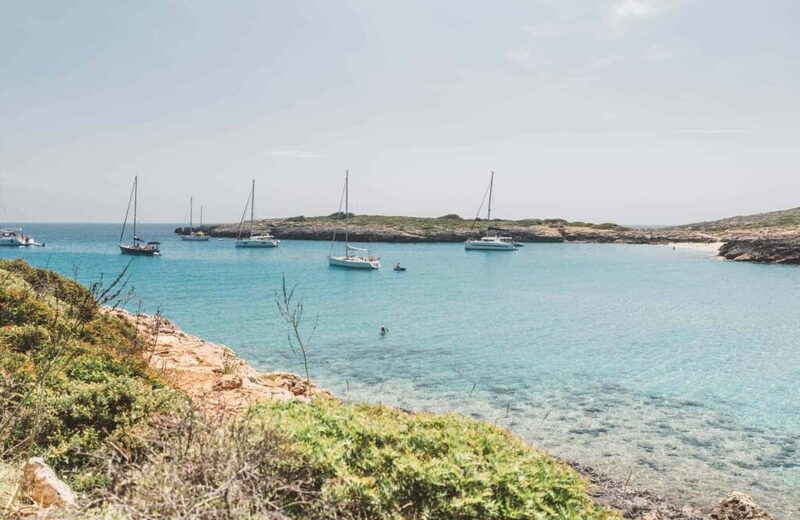 Not your traditional beach, Cala S’Almunia seems to exist solely as a launching point for its resident’s boats. But that hasn’t stopped locals using the rocky bank as a secluded spot to lay out the beach towel and take a dip in the impossibly calm and clear water. A few adventurous swimmers jumped off cliffs into a natural swimming hole, while others headed around the bank for a scenic spot to soak in the views. It’s certainly a beach with a difference. And the lack of sand doesn’t hinder its appeal at all. 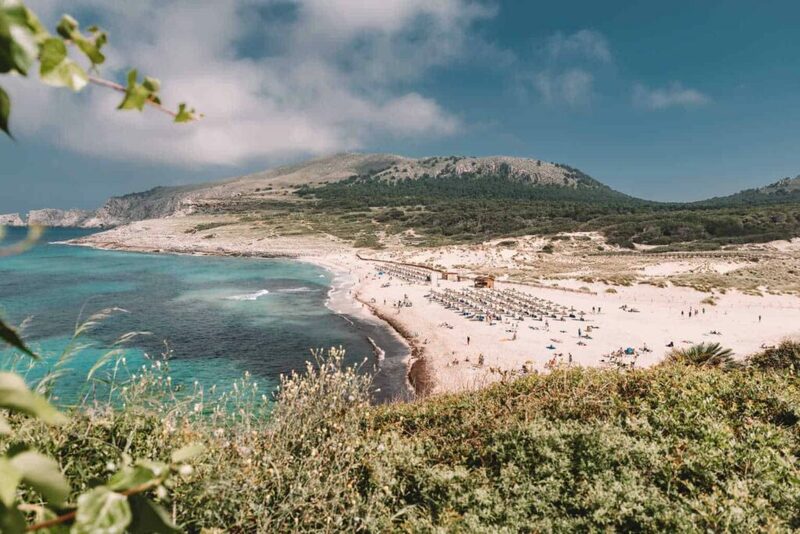 What makes Cala S’Almunia one of the best beaches in Majorca? The unpretentious nature of the surroundings really sets this beach apart. It offers an insight into how the locals live and enjoy the nature (quite literally) on their doorstep. It’s not the most beautiful beach (unless you count the wonderful stone buildings behind it) but it makes for a fab swimming spot. 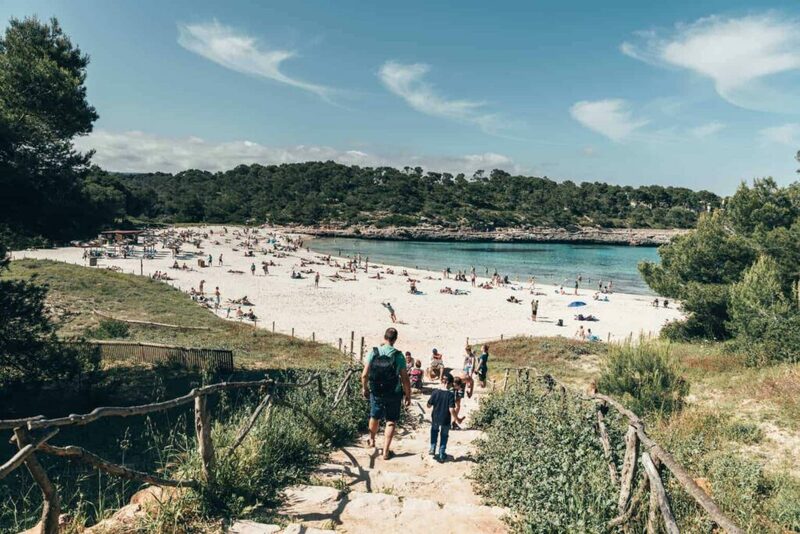 As with Caló des Moro, proceed to the end of Carrer des Caló des Moro where you’ll find a large sign pointing to the beach. Walk down the staircase and you can choose to wander over to the right side which is sandier, or the left side with its stone houses. Or, do what the locals do and set up shop right on the rocks in front of you! Visiting any of Mallorca’s beaches is a truly rewarding experience. But taking the time to seek out a true hidden gem – a beach tucked away out of plain sight – takes the adventure to a whole new level! Which of Mallorca’s most beautiful beaches will you be adding to your bucket list? Tbilisi is a place of much mystery and intrigue. It’s one of those places you wish you knew more about, and yet it can seem a bit elusive in its allure. 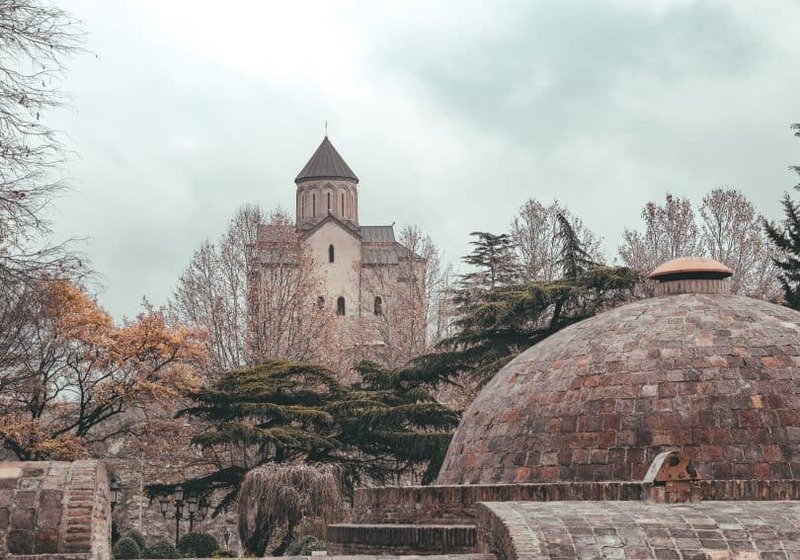 I recently had the chance to visit Tbilisi in winter, and I wasn’t quite sure what to expect from the capital of this former Soviet republic. What I experienced in Tbilisi was a city of juxtaposition. Sometimes tantalisingly so, and at other times the contrast was heartbreaking. Georgia, the country that so often gets confused with the American state of the same name, is located next to Turkey, on the edge of the Black Sea. But it doesn’t only share a border with Turkey. Russia, Armenia, and Azerbaijan all rub shoulders with Georgia and add to the country’s ambiguous identity. So is Georgia in Europe? Technically, not really. But it does identify as such. And while you’re visiting Tbilisi, you’ll have no doubt that there’s a very Eastern-European look and feel to the city. Like most destinations in the northern hemisphere, Tbilisi is busier in the summertime. But does that make the summer the best time to visit? But I think Tbilisi really shines as a winter destination. Imagine sinking into one of the famed sulphur baths after a tour of the old town or an afternoon sampling Georgia’s divine wines. Or seeing the church steeples rising above a city blanketed in snow. It’s hard to name the best month to visit Tbilisi, Georgia, but December is a good bet if you want to combine the best the city has to offer while also enjoying the festive spirit of the city. Surprisingly so! In fact, I’d go as far as saying it’s one of the best destinations for budget travellers. Food & drink prices – even in high-end establishments – are very reasonable, transport costs are low, and it’s possible to find affordable accommodation throughout the city. Tbilisi, and Georgia, in general, is considered to be a very safe destination. But, as always, it pays to be vigilant, just as you would when travelling anywhere in the world. Keep valuables close, stay aware of your surroundings, and keep a phone on you in case of an emergency. Georgia in winter is going to be cold, no doubt about that. However, Tbilisi rarely gets below zero degrees (Celsius), has an average temperature of 5 degrees in December, and snowfall is common. But you’re less likely to get wet weather in Tbilisi in winter than if you were to travel in the spring or autumn. Daylight hours are fairly long in winter, with the shortest day of the year seeing around 9 hours of sunlight. So what can you expect in Tbilisi in winter? Fairly long, cool and dry days with the possibility of snowfall. When travelling to Tbilisi in winter, you’re not going to need to pack anything out of the ordinary. Just make sure you have the essentials on hand – like a warm jacket, gloves and a scarf – and plenty of layers. Outside is cold, but unless you’re going to the countryside, you won’t need your ski jacket! Georgia’s dress code features a lot of black and dark tones. People dress smartly. And once you get inside, you can expect to be warm – hence the need for layers. Visiting Tbilisi in December may be cold, but there’s plenty going on in the city to keep you warm. Unlike elsewhere at Christmas, you don’t get the feeling that the city is ‘wrapping up for the year’. Partly because Xmas is celebrated later in Georgia (more on that below) – so it’s more like business as usual in the capital. Travelling to Tbilisi in the quieter tourist season meant we got to sample life as it usually is (plus a few surprises like running into a Bollywood film in mid-production!). The bars and restaurants were humming with locals, we never had to queue for anything, and getting a slot at the sulphur baths was no trouble at the drop of a hat. Visit Leghvtakhevi waterfall – Right in the heart of the old town, this beautiful waterfall is made even more dramatic by its surroundings. Walk up to the Botanical Gardens to see it from another angle. Sulphur baths – No visit to Tbilisi would be complete without a soak in one of the traditional sulphur baths. Choose a lavish private spa experience, or opt for the communal pools – there’s plenty of choice in the bath district. Tour of the old town – A mixture of influences and a muddled history means the architecture in Tbilisi is a glorious medley of styles. Take a guided tour to really appreciate the antiquity on display. 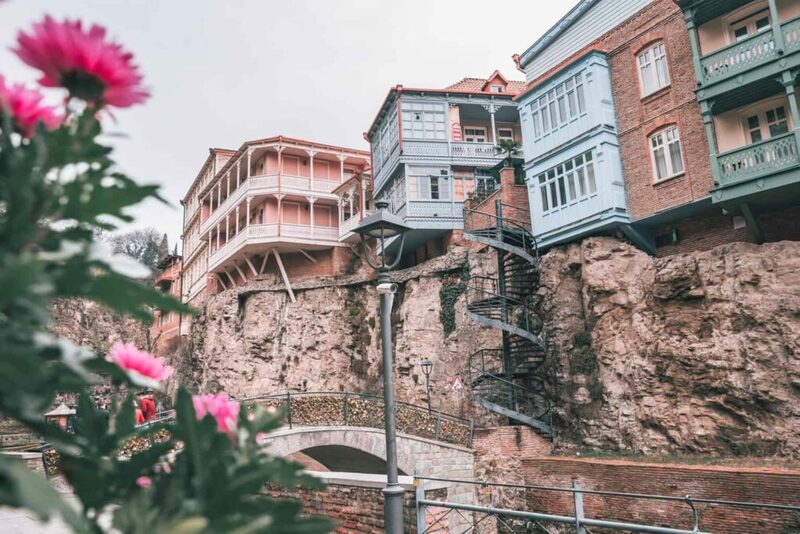 Take the cable car to Narikala Fortress – A short but fun ride in the cable car will deliver you to the gates of the 4th-century fortress that overshadows Tbilisi. Take the cable car back down or walk the Narikala Tourist route which will deliver you back after a scenic stroll. Ride the funicular to Mtatsminda Park – You can drive to this hilltop amusement park, but it’s much more fun to ride the funicular! Then spend the day exploring the rides and attractions on offer at the top. Go shopping – The shopping scene in Tbilisi is amazing. Yes, they’ve got your usual brands, but it’s the independent designers and fun boutique stores that really caught my eye. Hit up the markets too for authentic antiques and souvenirs. Sample the region’s wines – As one of the oldest wine regions in the world, Georgia’s vintages deserve to be appreciated. You could head outside of the city and visit the vineyards yourself, or you could make a beeline for a wine cellar and try many different varieties at once. Eat your way through the city – the food in Tbilisi is incredible, and the prices are minuscule. So do yourself a favour and try out as many of the traditional Georgian dishes as you can! 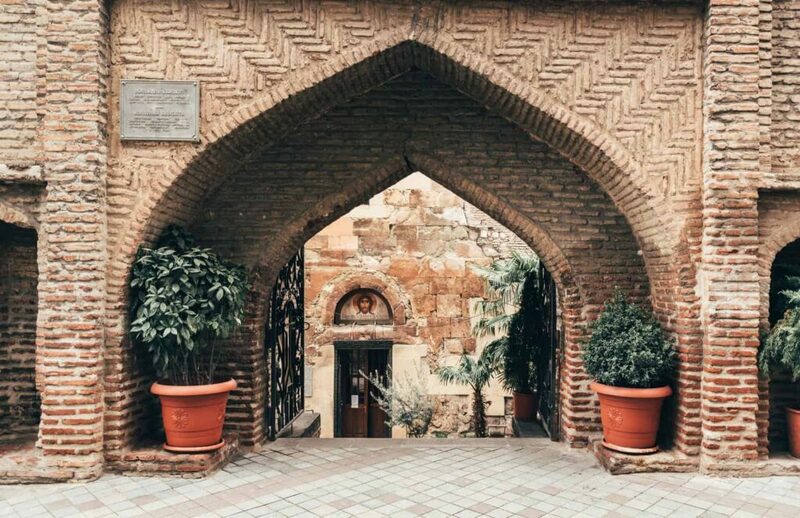 Peek into elaborate entrance halls – Behind nondescript doors, you’ll find the most fascinating entrance halls in Tbilisi. Hard to find unless you know exactly where to go, these grand halls are like pieces of art in their own right. 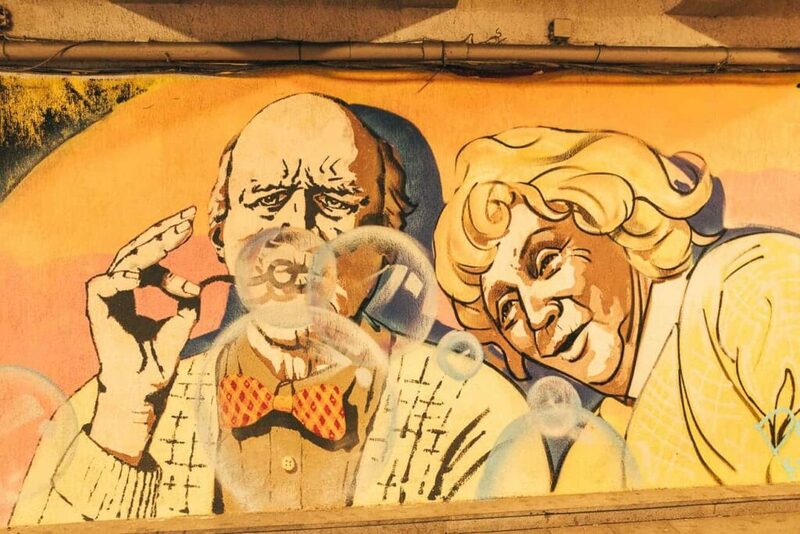 Seek out the street art – There’s plenty of art displayed in Tbilisi’s streets. Street art lovers’ will be in their element wandering the alleyways and tunnels throughout the city to get a glimpse of the offbeat art on display. If you’re staying in Tbilisi more than a few days, you should take the opportunity to take a day trip outside of the city to see more of what Georgia has to offer. Here are a few ideas for day trips from Tbilisi that are less than 2 hours away. A disclaimer: I didn’t have the chance to try out any of these trips during my time in Tbilisi, but researching them has aided my appetite to head back to Georgia! 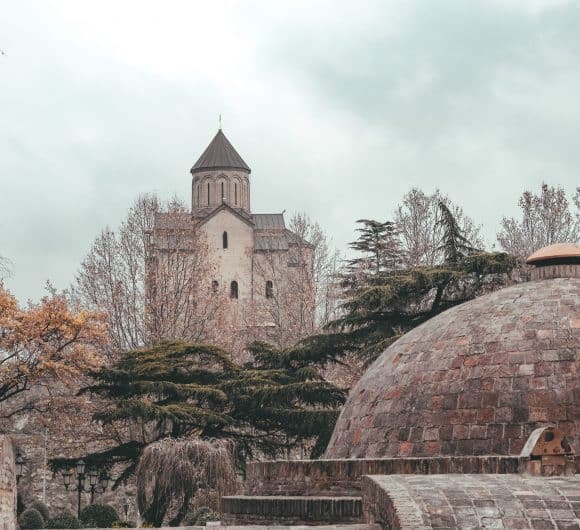 Visit Kakheti wine region – with almost 3/4 of Georgia’s wine grapes being grown in the region, Kakheti is a must-do if you want to find out what makes the country’s wine so remarkable. Just a two-hour drive will have you in the heart of wine country where you can meet the winemakers and sample their wares. Hit the ski field – one of the greatest advantages of visiting Tbilisi in winter is the ease at which you can access some of Georgia’s finest ski fields. A couple hour’s drive will see you in Gudauri where you can find world-class skiing at a fraction of the cost, and if you’re a beginner, you can take advantage of the English-language ski lessons too. 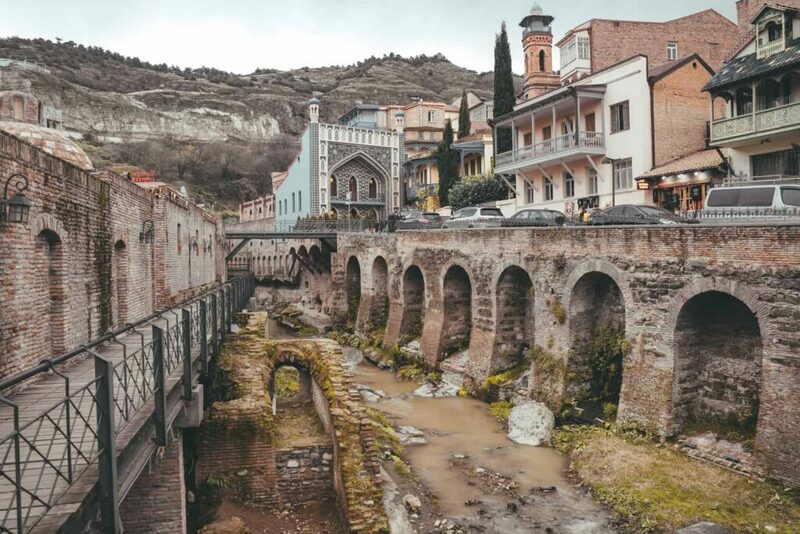 Find a UNESCO site on your doorstep – One of the closest day trip destinations from Tbilisi, Mtskheta is also one of the oldest cities in the country. Over 3,000 years old, it’s the perfect place to dig deeper into Georgia’s history and visit some of the most monumental landmarks in the country. Tbilisi Sea/Chronicles of Georgia Monument day trip – with the actual (Black) sea being around a five-hour drive away, Tbilisi locals have adopted a nearby lake as their seaside destination of choice. Obviously, the so-called Tbilisi Sea is more of a summer day trip destination; so if you’re visiting in winter, take a peek at it before heading to the nearby Chronicles of Georgia Monument. It’s ginormous in stature and hugely impressive. Plus, it offers a great viewpoint of the city. Georgia is an Orthodox country and consequently celebrates Christmas on January 7th. But that’s not to say you’ll miss out on Christmas festivities if you visit Tbilisi in December. Quite the opposite. The Tbilisi town hall prides themselves on their festive decorations – and it shows! The lights spanning the main streets in town were incredible, and decorations hung from many a shop window. In saying that, the ‘holiday season’ officially starts later in the month. And as a consequence, we did miss out on seeing the famed Xmas tree (the largest in the country) being lit up on the 22nd December. Some of the Christmas markets were just starting to get underway as we were leaving also. So if you want to make the most of the festive season, I’d recommend visiting closer to Christmas day. Or even extending your holidays by visiting closer to New Years, which is when the real party hits the town! If I had to name my favourite thing about visiting Tbilisi, it would have to be the food. Oh my goodness, the food. I wasn’t prepared for the flavours, the freshness, and the variety – even for a plant-eater like me. It blew all my preconceived notions of what food would be like in this former Soviet country (more potatoes anyone?) out of the water. Another delightful surprise was the quality (and quantity!) of the restaurants on offer. From trendy Scandinavian-style cafés to basement brick clad eateries with eclectic furnishings, and cosy candlelit diners, Tbilisi does the hospitality scene exceptionally well. I plan to write more about my culinary experiences in Tbilisi, but in the meantime, here are just a few of my favourites. These places stood out for the quality and flavour of their food, but also for the ambience they offered. I’ve listed this one first as it was my absolute favourite place to eat in Tbilisi! Amazing fresh flavours, beautiful presentation, cosy atmosphere – Culinarium Khasheria had it all. I just wish I’d bought some of their green adjika while I was there as I’ve been craving it since I left Georgia. Pick me up some if you go? Oozing with character, this quirky restaurant serves up Georgian-fusion food with a European flair (oh, and they have cute kitties to pat too!). Be sure to order the gobi to share – a large bowl full of typical Georgian dips and breads – it’s absolutely divine. Fabrika isn’t really a restaurant, it’s more of an everything-space. It packs a hostel, co-working space, art studios/shops and an eatery into a former sewing factory to create an energetic and creative meeting place. 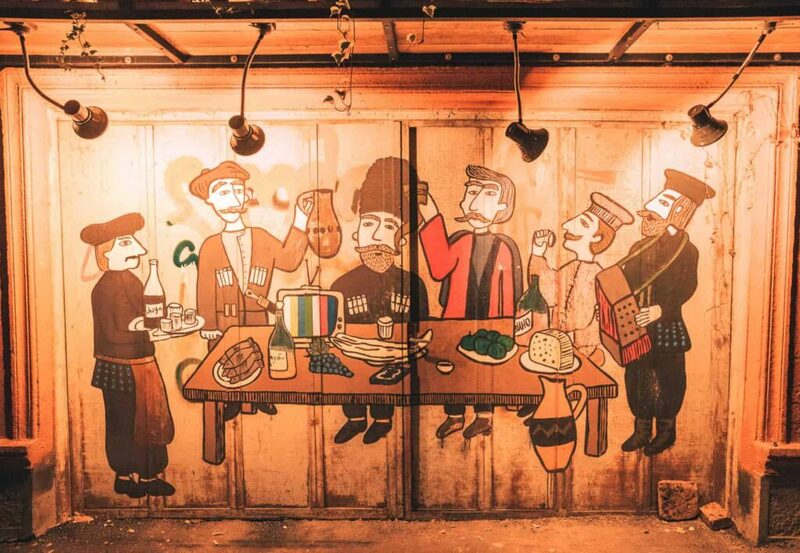 I’ve included Fabrika in this list, as it deserves to be visited for the ambience. But a disclosure – we had lunch here and it was very average compared to some of the other places we visited. I’ve heard the dinner menu is better. Cosy and intimate, Zala was designed to have a welcoming, homely vibe, and they succeeded. The only restaurant where the owner came out to check everything was ok, they take service one step further. The food was amazing (I had a flavoursome mushroom dish), but there were very few vegan options. Shopping in Tbilisi is a treat. Sure, there are all the usual high street stores in the city centre, but dig a little deeper and you’ll find beautiful boutiques selling everything from local couture to ceramics. I’m not sure if it’s a trend-setting, or trend-breaking theme running through the city, but there’s some serious talent on offer. I only wish I’d had more time, and money, to explore the shops in more depth! If you’re looking for a more traditional souvenir to take home with you, look for the intricate cloisonné (enamel) jewellery that is typical of Georgia, or anything made of wool. Wool has been an important industry in Georgia for decades and the locals love turning this natural product into beautiful handmade garments. Nighttime is when Tbilisi really comes to life. Even in winter, it’s usual to see plenty of people about until the wee hours. The bars are busy but not crowded, and the restaurants are still serving late into the night. There’s a real mix of trendy industrial clubs, low key wine bars, and everything in between. And as with everything, drinking in Tbilisi won’t bleed you dry! Gone are the days of red-eye flights and connections in Istanbul – at least that is, if you live in the UK. Georgian Airways now fly direct from London to Tbilisi twice a week, making the journey a much more seamless experience. If you’re coming from elsewhere in Western Europe, you’ll more likely have to change planes on the way. I flew with Turkish Airways from Marseille through to Istanbul, had a quick stopover, and arrived in Tbilisi a little more than 6 hours after I left France. The experience of transiting wasn’t bad at all, and the flights were very comfortable. Ideally, staying central is the way to go when visiting Tbilisi. The capital city is remarkably walkable and you’ll want to be close to the main attractions and activities. I stayed in the Rooms Hotel which was ideal. 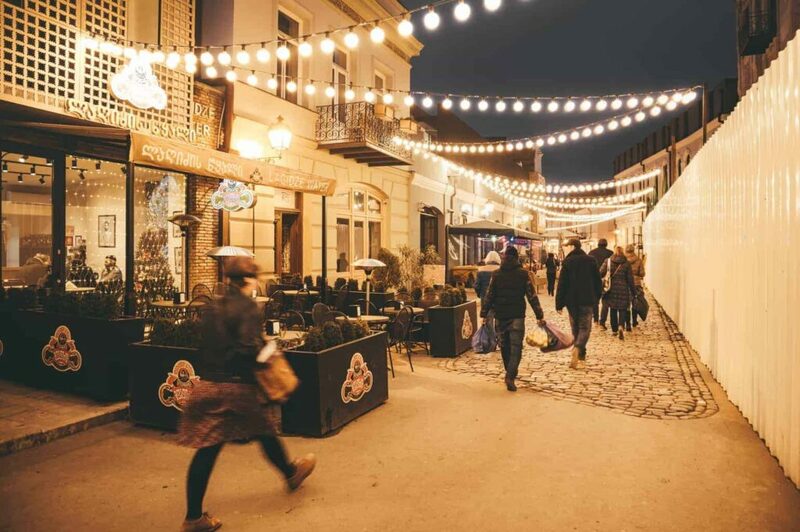 Well located for the city centre, bars, restaurants and shops, yet two blocks away you have quiet residential streets – it was a great place to get acquainted with Tbilisi. The rooms were spacious and comfortable, and the breakfast spread was sublime! Book your room here. Alternatively, read this helpful guide on where to stay in Tbilisi. I normally love renting a car when I’m staying anywhere for a few days or more. But Tbilisi isn’t somewhere I’d feel super comfortable doing so. Georgians have a somewhat unique driving style, and the road rules are indecipherable to an outsider. Luckily, staying in the central city I had little need to drive anyway. If you do find yourself needing to get further afield, taxis are an affordable option. But by far the cheapest option is to jump on the public transport system. There is a metro system and plenty of buses to take you where you need to go. Travel outside of peak times to avoid the crowds. What currency do they use in Georgia? The time zone in Tbilisi Georgia is GMT+4. Coming from France, I found this time difference an easy one to get used to. If anything, it got me out of bed earlier to start the day exploring! WiFi is available throughout Tbilisi city centre. Just look for the Tbilisi Loves You network and you can join for free. I found this super handy as my network provider was going to charge a fortune for roaming data in Georgia. The Georgian language is a tricky one. Not just to speak, but to read also. Luckily, most people I encountered spoke English well so after an initial “Gamarjoba!” there was no need to blunder my way through. You’ll also find there are signs, menus and instructions in English as well as Georgian throughout the city. But as with anywhere you travel, it’s always good to have a few key phrases on hand – for politeness and to show respect for the country you are visiting. Tbilisi, Georgia is an interesting and diverse holiday destination with a lot to offer visitors. It has a unique flavour that’s somewhat eclectic in nature and yet it keeps you enthralled. Whether Tbilisi is somewhere you’ve never thought of visiting before, or it’s high on your bucket list, I hope this guide to visiting Tbilisi in winter has offered plenty of inspiration and useful advice. *My trip to Tbilisi, Georgia was hosted by the city hall. As always, all opinions expressed are my own. I once read somewhere that there were “no impressive castles in Provence”. And while I understand where the writer was coming from with this sentiment, after 3 years in the region, I now realise it really depends on your interpretation of impressive. 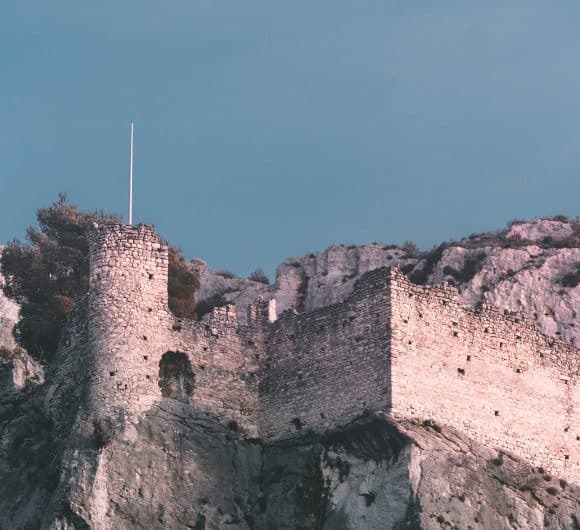 While it’s true that many of the most beautiful castles reside in other parts of France, Provence is a place of immense history and drama, and our castles (or what remains of them) reflect this beautifully. The castles in Southern France are generally not in the same league as the likes of Chantilly or Versailles in the north, but they have their own unique charm and plenty of stories to tell. The ten Provence châteaux highlighted in this list are those that are loved by locals in the know, but rarely receive the attention of visitors to the region. They’re the evidence of turbulent times past, and usually, places of stunning natural and historical beauty. And sometimes, they can be a little hard to find. So let me help you discover these secret châteaux of Provence, France. There are dozens of castles in Provence. Seemingly every hilltop village and rocky spur is topped with the telltale signs of the region’s imperial past. However, some are now privately owned, many are unsafe to visit, and other’s have been made into tourist attractions to require a fee to visit (e.g. Château des Baux de Provence). The following French châteaux are special in that they’re either secluded, largely undiscovered, or places of immense historical significance. Enjoy getting to know this lesser-known side of Provence! One of our absolute favourite walking spots in Provence, the Vernègues castle is situated at one edge of a raised plateau. As with others in the region, the former village of Vernègues was destroyed by natural disaster. In June 1909, the village was flattened and later rebuilt on the more stable ground further down the hill. Today all that remains of the ‘Vieux Vernègues’ are the château walls and the ghostly stone structures of a few village dwellings. While the castle itself is unsafe to investigate at close quarters (due to the unstable nature of the structure), there are still plenty of nooks and crannies to discover. Descend ancient staircases into underground caves, climb through low slung doorways for exceptional views, and marvel at how grand the hilltop château must have once looked at the helm of the village. Despite its deteriorated state, it’s an imposing sight and must have made quite a statement when it was built in the middle ages. Driving through Vernègues, you will see a sign in the direction of Vieux Vernègues. Follow the aptly named Rue du Vieux Vernègues as it snakes up the hill before branching out to the left of the château. It’s here you’ll find a large unstructured parking lot. Leave your car here and proceed on foot for the final 120 meters to the entrance of the site. Then you can follow the wider gravel path around the site, or take one of the well-trodden paths that stem off the main route to discover the hidden caves and houses on your way up the hill. I’d recommend the latter! Once you reach the plateau, take your time to explore the various pathways which will lead you to an orientation table, and an incredible view over the village of Alleins (where there is another castle to discover, see below). And on the way back down, be sure to take the small detour to the Église Saint Jacques which is stunning in its semi-ruined state. Driving north into Alleins from Vernègues, you are greeted with the most picturesque view of this small Provençal village. Pastel coloured townhouses huddle around a barren hill, atop of which you’ll find the stately remains of the Château d’Alleins. Once a castle fit for the noble Renaud family, the château walls now house more pigeons than people, but you can still make out the general shape and structure of the 15th-century building. Alleins itself is a severely underrated gem of a village. 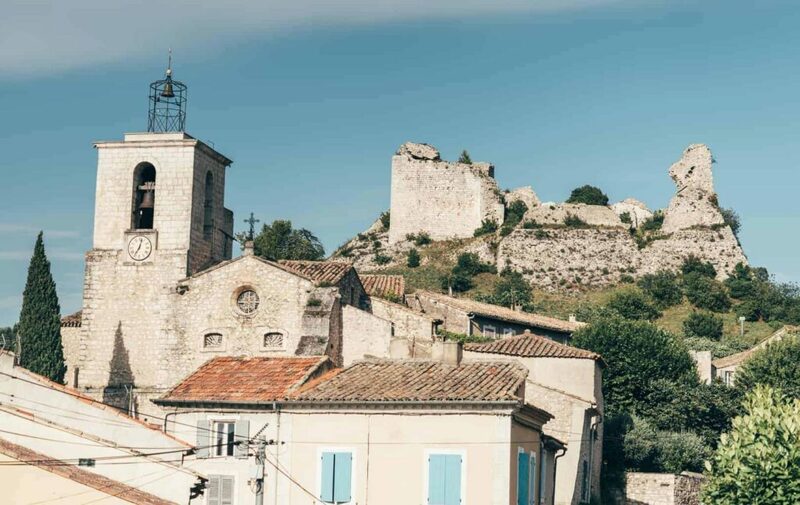 It’s one of those few villages in Provence that goes undetected by tourists, and yet it’s absolutely littered with unique and well-restored relics dating back as far as the 10th century. 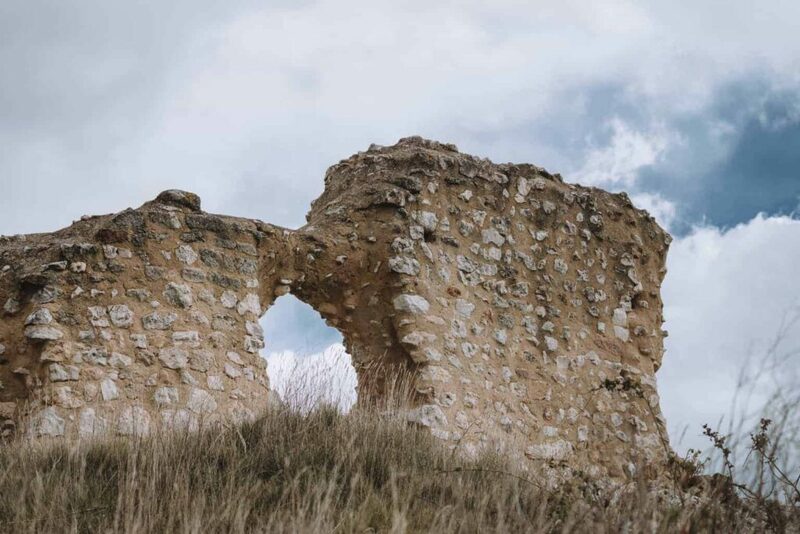 Indeed, before the most recent castle was built for the Renaud family, there is evidence another castle once lived on the same spot around 500 years earlier. If you pop onto the village website you can download a walking map (in French) of the various ancient attractions including beautiful old mills, churches and le donjon which now houses a restaurant. If you find yourself in Alleins, you won’t be able to miss the château! There are many ways to access it, and once you do you’ll be rewarded with a stunning view of the village. The most ‘official’ entrance to the castle is up a cobbled walkway from either Rue de la Liberté or Rue de la Fraternité. But you can also walk up the grassy bank opposite the SPAR on the main street. It’s a short walk to the castle but one worth doing to explore this ancient site unlike any other. The original Rognes settlement was situated on the slopes of the Foussa – the small hill at the centre of the village. A grand château stood at its centre until it was dismantled during the 16th century. Now, all that remains of this original village are the castle ruins and, further down the hill, a few lucky houses that escaped total collapse. But the history of Rognes dates back much further and there is evidence of human habitation in this area since the Iron Age. Despite its turbulent past, Rognes has prospered and become a popular village in Provence, in part due to its proximity to Aix-en-Provence and the Luberon. As you wander through the old town, the castle ruins at the top aren’t immediately obvious. But once you find the discreet path that leads up the Foussa to the ruins you’ll be rewarded with a stunning view over the village, nearby farms and the Luberon Valley in the distance. There are two clear walking paths up the Foussa to the old village. The first, off Avenue des Cegares, is easily missed. Little more than a skinny dirt track, you need to keep a look out for it as you enter the avenue. This path will lead you up the hill, past ruined dwellings and crumbling caves, under the last remaining wall of the château, and up to the crest. Here you can climb the rocky spur for a better vantage point, discover the castle ruins, and enjoy the uninterrupted views. The other ‘official’ way up to the Vieux Rognes is at the end of the Avenue de la Campanette, although there are plenty of small tracks and routes to explore. Just watch your step, as it’s steep in places! Above the present-day village of Mérindol lies the remains of another, much older village. Although it sustained significant damage during the religious wars in the 16th century – making the village uninhabitable – what was left behind has weathered the years remarkably well. Here, unlike in some of the other ruins of Provence, you’ll find a series of structures that still somewhat resembles a village. Doors, walls and cobbled alleyways lead you through the maze of stonework to the castrum at the top. 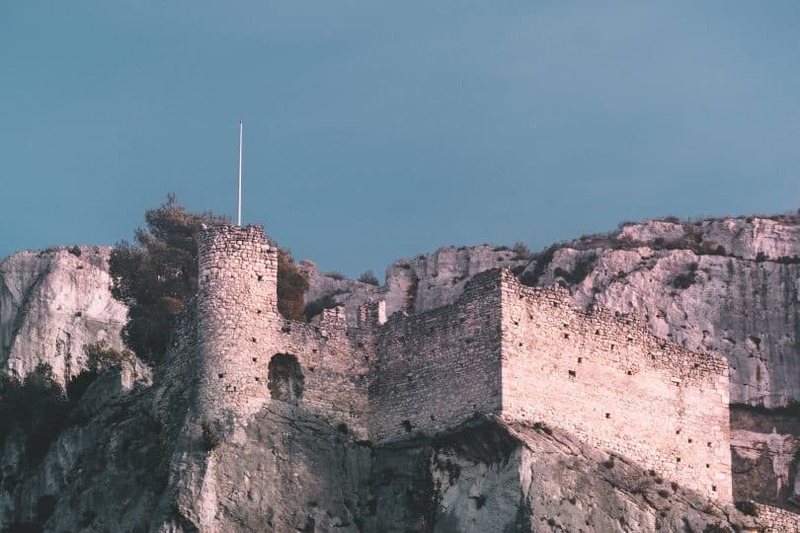 Unfortunately, the château itself has borne the brunt of the damage, and all that remains is are a couple of walls that frame the craggy cliffs behind the village. The surrounding countryside is beautiful and you won’t be wasting your time with the short walk to the top. You’ll also find an orientation table to get your bearings of the Provençal landscape. The most obvious, and convenient way to access the old Mérindol castle and village is at the edge of the newer village. Park at the village parking lot at the end of Rue des Cigales and follow the path up through the olive grove. There’s a large green sign to direct you, so you’re unlikely to get lost. This will lead you up to Chemin de l’Apied where you can start your exploration of the site. Don’t try to drive closer as the roads are very narrow with little options for turning around if you find yourself stuck! An alternate route, and the one we took the first time we visited, is to drive up Chemin du Maou Traou before turning right onto a small gravel road. It’s a private road, but there is a cleared area of bush where we parked the car. From here, you follow the road into the bush before joining the path to the castrum. As seen on the map above. Another victim of natural disaster, this medieval castle survived years of political and religious unrest before being all but destroyed in the 20th Century. The 1909 earthquake reduced it to a lone tower (the keel), and 70 years later that was struck down by lightning! The town rebuilt la quille in 1994 and it’s this reincarnation that you’ll visit today. You’ll still need to use your imagination a fair bit to understand what these castle ruins once looked like. The oppidum that houses the keel is in arguably better condition, despite its age. Dating as far back as the 4th century BC, it was occupied again in the Middle Ages, when the walls were rebuilt. These ramparts circle the hill creating terraces and natural walkways. It’s a charming site to walk through, one which many visitors to Provence are yet to discover. La Quilho is situated overlooking the small hamlet of La Cride, just a short distance from the famous Château la Coste. To reach the oppidum and the keel, turn into Chemin de St Jean off the main road. Take care if you’re travelling from the South, as it’s just around a narrow bend and you’re likely to miss it! This street will take you all the way to the beginning of the walk where you can continue by foot to explore the ancient hilltop settlement. This walking map will explain the route further and give directions to the keel and the orientation table. 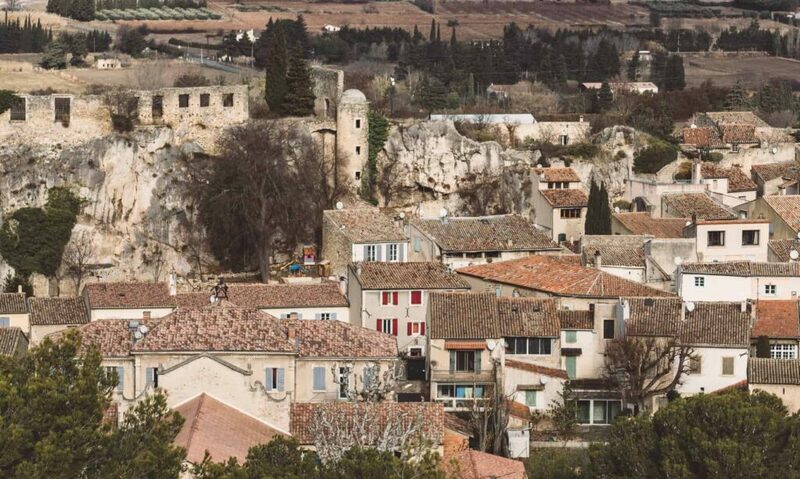 The village of Eygalières is one of the most charming villages in the Alpilles. It’s hard to say exactly what it is that sets it apart from other villages in the vicinity, but there is a certain je ne sais quoi about it. At the top of the hillside village, you’ll find the ruins of the ancient settlement. Not much can be seen of the original castle, except the foundations and the donjon which was transformed into a prison in the 13th century. On top of the dungeon, you’ll see the statue of the virgin mary which was placed there in 1893 to celebrate a miracle. Only there’s nothing on record to note what the miracle actually was, so you’ll have to use your imagination on that one! You’ll also be able to visit the remains of the Saint-Laurent chapel, and the clock tower that was constructed using stones from the castle in 1672. It’s a short walk to the old village of Eygalières, and once again you’ll be better off leaving your car in the newer part of the village. You can drive up, but it’s extremely narrow with limited parking space. Wander past the new Saint-Laurent chapel and continue up the hill on Rue du Dr Roque until you find the walkway on your right. The stairs will deliver you directly to the château ruins. From there, you can loop around the hill to visit the old church and continue away from the village where you’ll find a windmill-turned-dovecote. Then backtrack to the old village, or continue down the dusty track which eventually links back up with the main road into Eygalières – just be warned, it doesn’t have a verge for walking on until you reach the village boundary again. 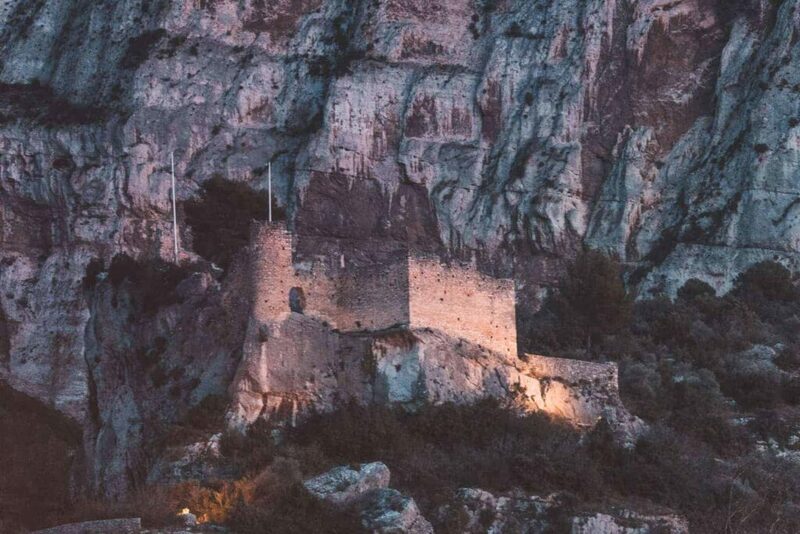 I’ve written about Château de Cadenet before, and it’s still one of my favourite castle ruins in France. The site is relatively large given the petite village that rests at its heels, and it’s a really interesting and varied place to visit. The castle itself dates back to the 11th century and was partially destroyed in the 17th century before suffering further damage inflicted by revolutionaries in 1792. But despite its turbulent past and extensive damage, it is still a very impressive ruined castle to explore. But what makes this place even more amazing are the troglodyte caves pockmarked around the hill that supports the château. Take your time to explore both the rooms of the castle and the prehistoric caves nearby. At present, the village of Cadenet is undergoing some roadworks, making the route to the château a little precarious. However, it’s just a matter of ignoring your GPS and hanging a right at the first roundabout in the village (marked on the map above), and then continuing up Boulevard de la Liberté, onto Chemin des Rougettes, and then following the signs to the ‘site du château’. This will take you to the top of the castle, where there is a small carpark and a large open field. Alternatively, you can park at the carpark on Rue Raspail and walk to the château from there. Whichever way you arrive at the castle, be sure to visit each level in turn, ducking into caves and secret stairwells, weaving through tunnels and finishing with a walk through the wooded forest to find the hidden caves. The village of Orgon sits on the edge of the Alpilles. Its unfortunate proximity to the Motorway and slightly rough looking exterior means it often gets overlooked in favour of more secluded villages. But delve into the heart of the settlement and you’ll find a beautiful, quiet and authentic little village with plenty to offer. Once home to a formidable castle, Orgon still has done well to preserve its heritage. Before you even enter the village the sight of the magnificent Eglise Notre Dame de Beauregard is sure to catch your eye. Situated high on a prehistoric oppidum overlooking the village, it’s well worth a visit in its own right. Then, as you enter the village through one of the fortified gates, you’ll no doubt spot the ruins of the Château du Duc de Guise sitting high above the rooftops. 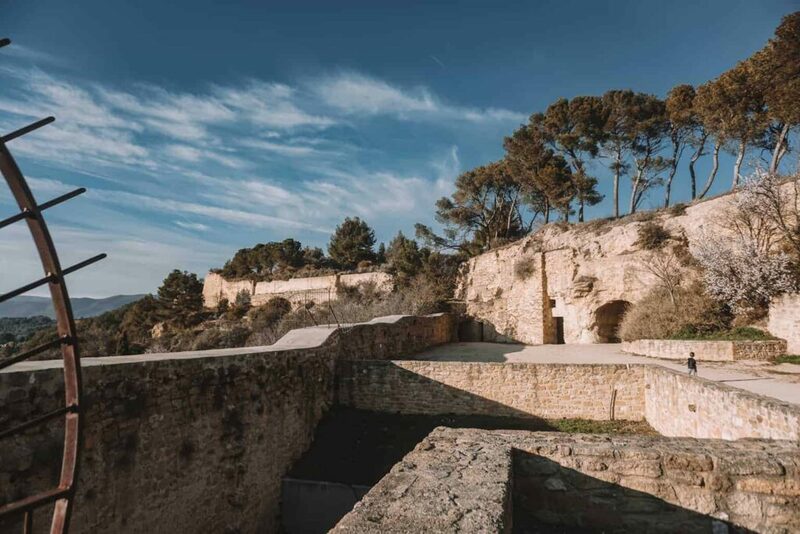 It’s one of the oldest castles in Provence and as well as being very accessible, it’s a fascinating place to explore. 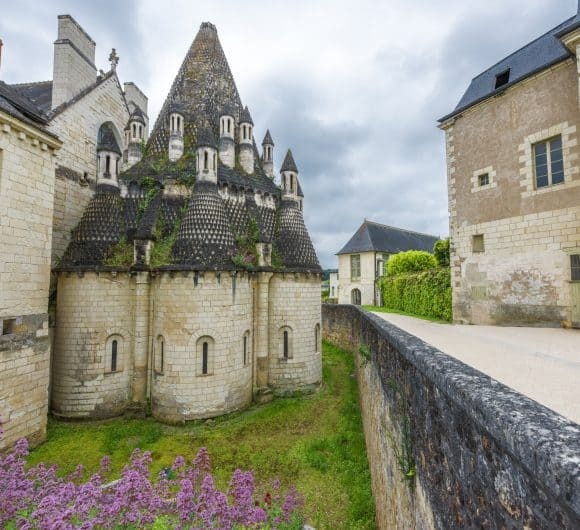 To reach le château du Duc de Guise, park in the village and walk through the Porte de l’Hortet – the only remaining door of the original 12th-century fortification (there are two others from a later period). From here you’ll follow a path to the château. It’s a short but very pleasant walk around the château, or you can extend your exploration further by continuing up the hill to the Notre Dame de Beauregard church and the ruins that surround it. The ruins of this 10th-century castle are small in stature, but the scene that surrounds them is absolutely magical. Tucked away in a secluded valley, the Château de Beaumont le Vieux has been all but enveloped by the hill that supports it. And yet, the golden stones and crumbling tower wall that remain still manage to make a statement against the mountainous landscape. Situated near the famous Mt Ventoux, the village of Beaumont du Ventoux isn’t actually a village in itself, but rather a series of small hamlets that make up the commune. It’s here, among the tight-knit streets and neatly plotted rows of cypress trees that you’ll find what makes this commune unlike anywhere else in Provence. Home to the only ski station in the Vaucluse department, the undulating terrain has a different feel to the nearby Luberon Valley and is worth a visit for that reason alone. Go in the spring when the commune’s cherry crops are in full flower. 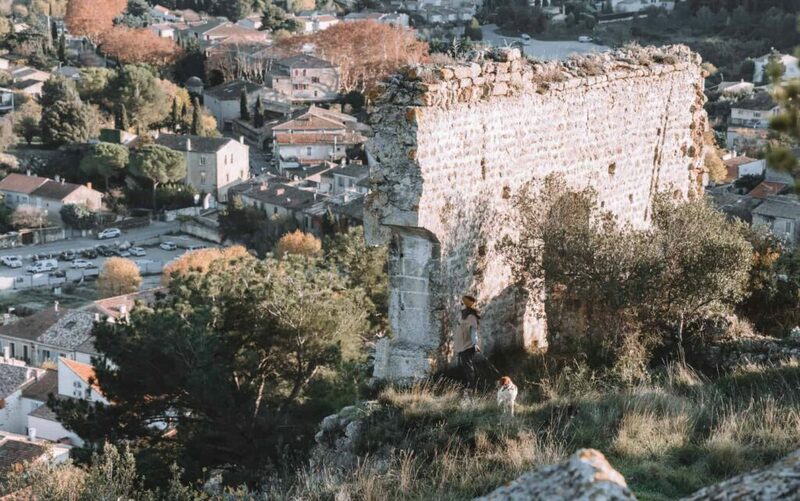 To find this hidden castle, you’ll drive into the tiny hamlet of Sainte-Marguerite. 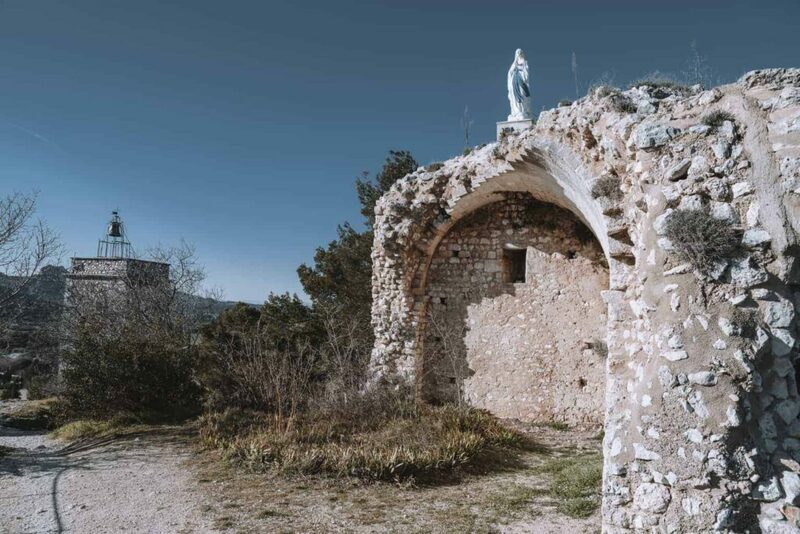 Stop to admire the petite romanesque Sainte-Marguerite chapel and think about finding a discreet place to leave your car here as the hamlet only gets narrower the further you drive in. Continue through the narrow thread of houses and take the last street on your right. This will lead you to a stone path that indicates the start of the walk. When we visited, we took the path up the hill past vineyards and old huts, right up to the crest of the hill. Here the path gets quite overgrown and hard to navigate. Because of this, we didn’t push on to the castle, but we were rewarded with a superb view of the ruins. On the way back down I noticed a subtle stack of rocks with a blue marker, indicating a shorter but steeper route to the castle should you wish to take that route. Fontaine de Vaucluse is famous for being the birthplace of the River Sorgue. Walk alongside the gently flowing river and you’ll eventually arrive at a deep spring etched into the base of a 240m cliff face. But high above the village is another remarkable sight. The Bishop’s Castle strikes an impressive figure above the petite village and it is an equally intriguing place to discover. The original castle on this site was built in the 11th century, but the remains that you visit today date back to the 12th century. They’re in reasonably good condition (for ruins) and you can delve into the castle to peek through its windows, peer into caves, and climb ancient stairs for a magnificent vantage point of the fontaine below. Parking throughout Fontaine de Vaucluse is plentiful in supply, but you have to pay a €4 flat fee for the privilege. From any of the car parks, make your way towards the eastern side of the village, near the tourist office. From here you can walk through a tunnel to reach the François Pétrarque museum (also worth a visit), or climb the stairway towards the château. The path is clearly marked, but it’s not without its challenges – especially for the young or elderly. There are sections where a ladder aides you to ascend a steep embankment, or where the rocks are particularly slippery. It is a short but steep climb to the castle. Once you’ve investigated the ruined castle and its surrounds you can continue on the same path which will take you higher and higher up into the valley of the Fountain of Oule. It’s a spectacular walk, with views to match! The Royal Abbey de Fontevraud, tucked away in a beautiful corner of the Loire Valley, is one of France’s finest examples of religious architecture and the perfect destination for a family day out. Step back into the region’s colourful medieval past and come face to face with some of England’s most notorious monarchs. Richard the Lionheart is surely one of England’s most iconic rulers. A fearsome crusader and warrior, he is perhaps best known as the absentee king of the Robin Hood legend, sweeping in at the end of the tale to restore order and tame the excesses of his cruel younger brother, Prince John. 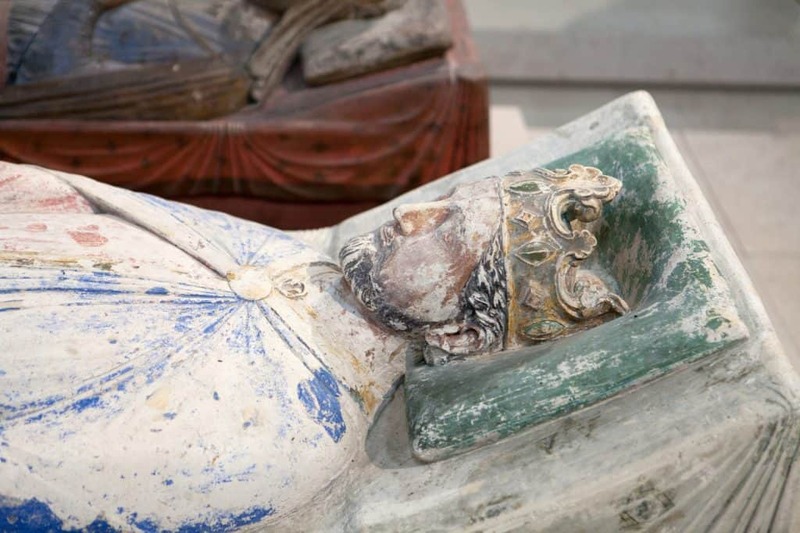 It may be surprising to learn, therefore, that Richard’s final resting place was not in England itself, but rather in the Royal Abbey of Fontevraud, in France’s Loire Valley. 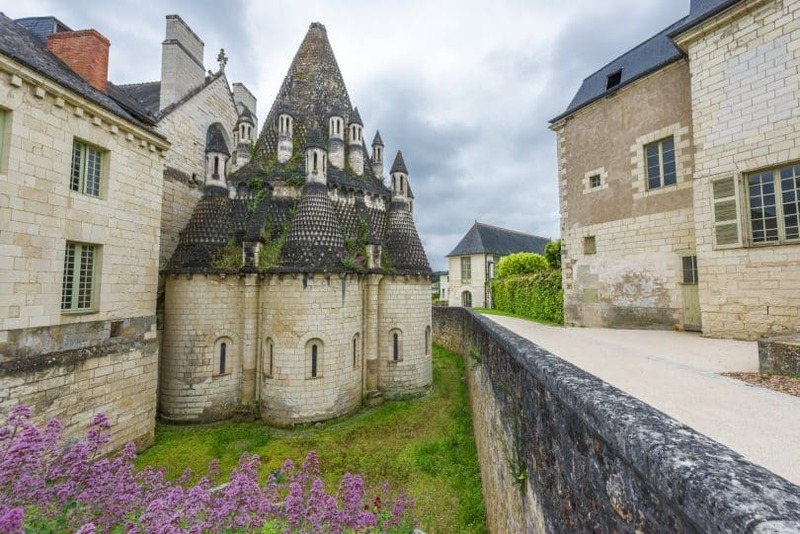 Fontevraud, perched on the banks of the Loire and close to the medieval city of Saumur, is a classic example of the closely intertwined relationship between England and France in the medieval period. Founded in 1101, this beautiful abbey is the final place of rest of not one, not two, but four English monarchs. Fontevraud was a favoured establishment of the Plantagenet kings, including the dynastic head, Henry II of England and his wife, the formidable Eleanor of Aquitaine, immortalised by Peter O’Toole and Katherine Hepburn in the epic 1968 film, The Lion in Winter. This was a period when English kings were culturally French, and major players in French politics, owning vast swathes of land from Normandy to Aquitaine. 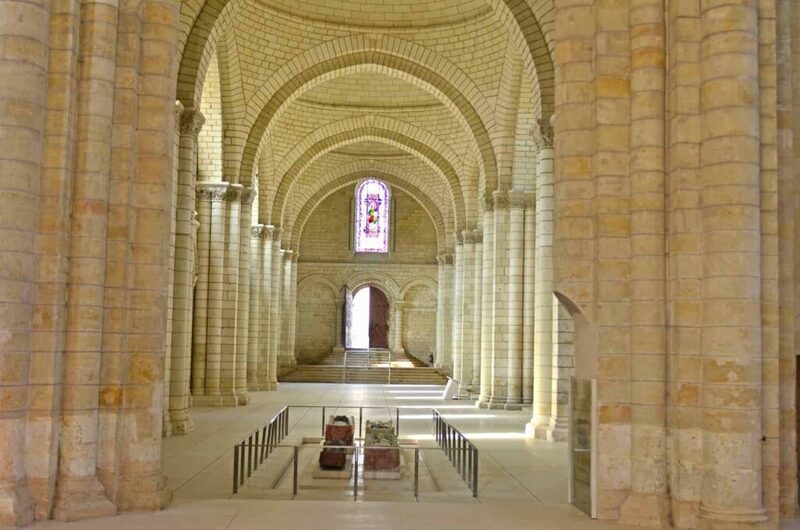 Henry and Eleanor were great supporters of Fontevraud, and under their patronage, the foundation grew swiftly into one of the most important religious sites in the region. It was also distinctive in its organisation, divided into four priories that housed monks, nuns, lay brethren and lepers, all ruled over by a powerful abbess. It remained a functioning abbey until Napoleon sacked the buildings and converted it into a prison in the early 19th century. However, today it stands proud, lovingly restored, as a testimony to France’s medieval past and a time when these two rival nations were inextricably connected. The biggest attraction is the magnificent 12th-century abbey church, a beautiful example of towering Romanesque architecture. The interior is stripped back and elegant, with a clever interactive display that allows younger visitors to design their own stained glass windows and project them onto the high walls of the church. It’s here you’ll find the tombs of Henry II, Eleanor of Aquitaine, Richard the Lionheart and Isabella of Angouleme, wife to Richard’s brother John. Their bones may have been scattered during the Revolution, but their effigies now take pride of place in this palatial, dramatic church. England’s kings certainly made their mark here, but it is perhaps Eleanor of Aquitaine, an important French landowner in her own right, who has left the deepest imprint. Defying the conventions of the age, Eleanor was a notorious schemer and political player and was ultimately imprisoned by her husband to prevent her from conspiring against him. She outlived him, and continued to dictate the course of English politics well into her old age, during the reigns of her two sons, Richard and John. An excellent exhibition in the abbey church describes her role in raising the ransom required for Richard’s release when he was captured on his return from the Holy Land after the Third Crusade. 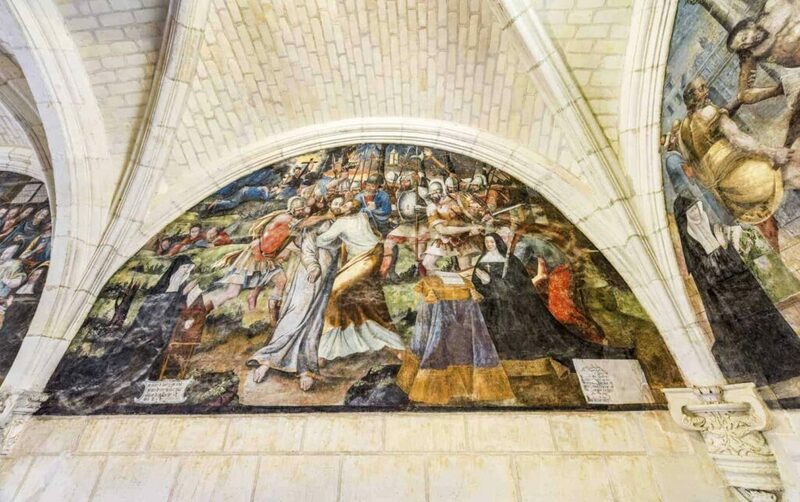 Fontevraud was a religious foundation where women ruled, and Eleanor made sure that its abbesses were well supported. A visit here is an ideal opportunity to witness the ways in which medieval women, despite the patriarchal restrictions of the period, were able to wield considerable economic, political and religious authority. There’s plenty to explore in the abbey complex, including the large chambers, dining halls, cloisters and gardens that were an essential part of the medieval foundation. One of the most fascinating rooms is the unusual octagonal kitchen, complete with 20 stone chimneys. The blackened stone shows precisely where the ovens would have been, and it’s easy to imagine this space as the bustling hub of the abbey, with a team of nuns baking bread around the clock, working hard to feed the many mouths that depended on them. The labyrinthine cellars that extend under the visitor centre are another highlight: these were used as a storehouse in the medieval period, but are now beautifully lit to create an atmospheric and eerie effect for visitors. 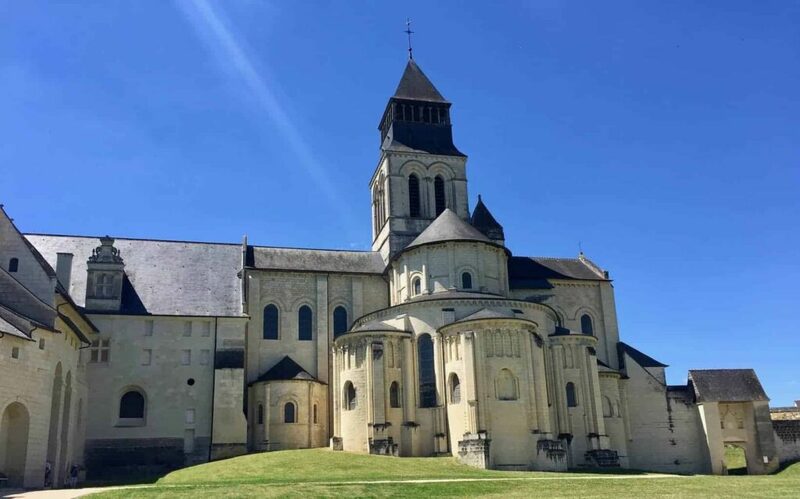 Perhaps the most impressive aspect of Fontevraud, however, is its magnificent setting, which shows off the Romanesque architecture to perfection. Nestled in 14 hectares of lush, green countryside, and encompassing a traditional medieval stone village, the abbey offers beautiful views down to the river and beyond. Make sure to take the time to wander through the abbey gardens, which provided food, herbs and medicinal plants to cater to the needs of residents, and visit the beautiful orchards. There’s plenty for children to explore too, with specially designed treasure hunts that can be completed using the iPads available at the visitor centre. Fontevraud also offers a great base from which to explore the surrounding countryside and castles, either on foot or by bike. Indeed, for a special treat, and the ideal way to immerse yourself in the region’s medieval past, stay overnight at the abbey hotel, situated in the beautifully restored rooms of the Saint-Lazare priory. These simple, elegant rooms are converted nuns’ cells (albeit with considerably more home comforts! ), and are beautifully decorated in a way that evokes the abbey’s medieval past while offering a taste of luxury. The accompanying restaurant, run by award-winning chef Thibaut Ruggeri, is the perfect way to round off the experience. Book your stay at Fontevraud L’Hôtel here. 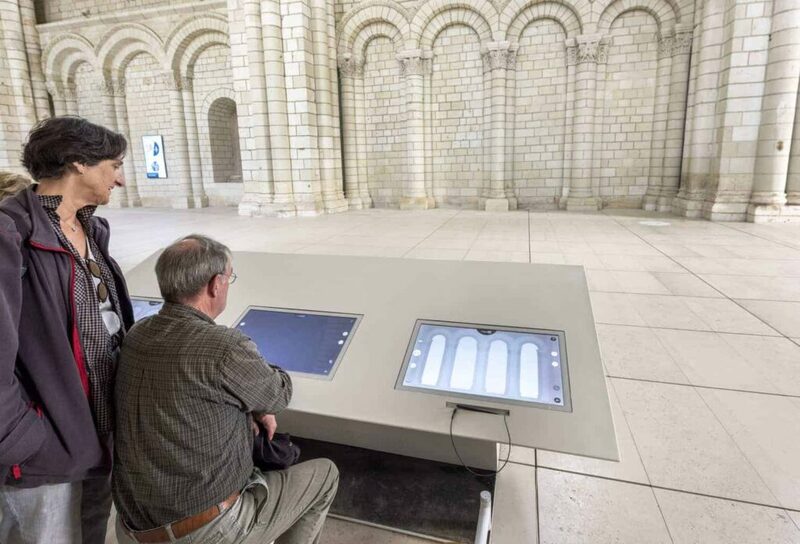 The restoration of Fontevraud may hark back to the medieval period, but it has also fully embraced the modern, digital age. Today, a smart visitor centre, complete with gift shop, restaurants and interactive high-tech visitor experiences, makes this a great destination for a Loire Valley day trip. The abbey regularly hosts contemporary art exhibitions and installations, concerts and plays, which will keep visitors of all ages entertained and engaged. There is even the opportunity to explore the abbey and grounds using virtual reality technology. This groundbreaking and innovative approach to bringing the past to life will excite and delight visitors and pushes the boundaries of the way we experience the past and look at historical monuments. The complex is open daily, year-round (except between Dec 25th and Jan 25th), and a family ticket may be purchased for €28. Audio guides, guided tours, and an interactive treasure hunt for children (complete with iPad) are available at an extra cost. The Royal Abbey de Fontevraud offers the perfect marriage between human innovation and natural beauty, between English and French, between the medieval and the modern. It’s a historical monument with a difference, providing a unique window into the medieval past through the creative use of up-to-the-minute technology. As a boundary-pushing medieval queen herself, I like to think that Eleanor would be proud. Helen Flatley is a medieval historian with a passion for travel, nature and hills. She has lived, studied and worked in France for the past five years, where the diverse landscapes, culinary delights, and cultural treasures have offered her ample opportunity to slake her wanderlust. She now divides her time between Paris and Oxford.